Salutations to Lord Ganesa Ganesa, the Remover of Obstacles; to Goddess Saraswathi, the all-pervading Mother of Learning, and to Nava Grahas, the destiny-makers of the Universe. 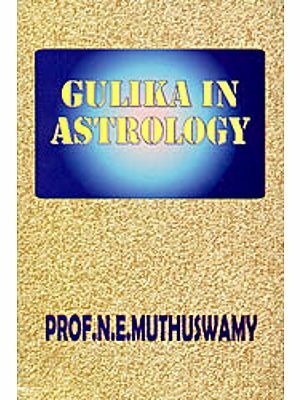 After bringing out Essentials of Predictive Hindu Astrology last year, I am happy to be amidst my readers with Book 1 of deva Keralam with English translation, notes etc. Some have heard the name of this work, Deva Keralam. 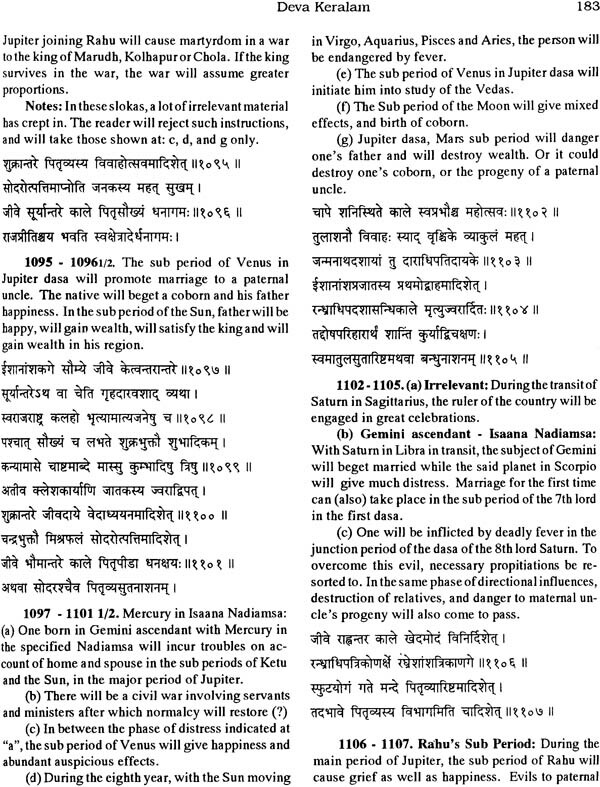 Some have seen the Sanskrit manuscript. 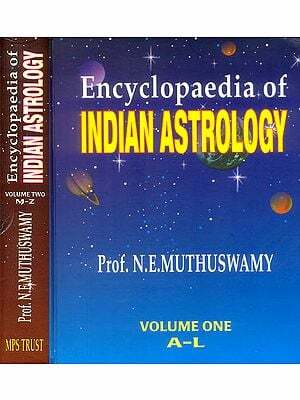 Yet, almost every student of astrology has been keen to possess an English translation of this work since decades. 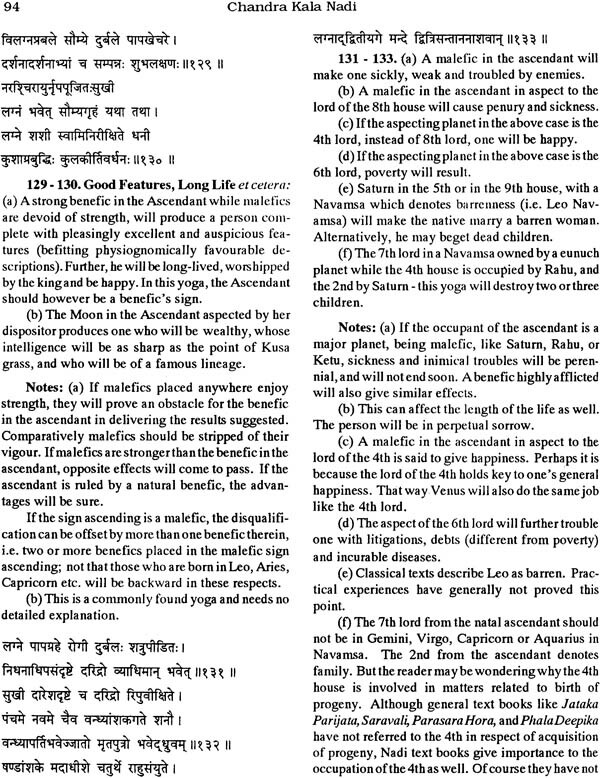 And, now, here is an occasion for all of us to actually enjoy the instructions of Achyuta, the author of Deva Keralam. 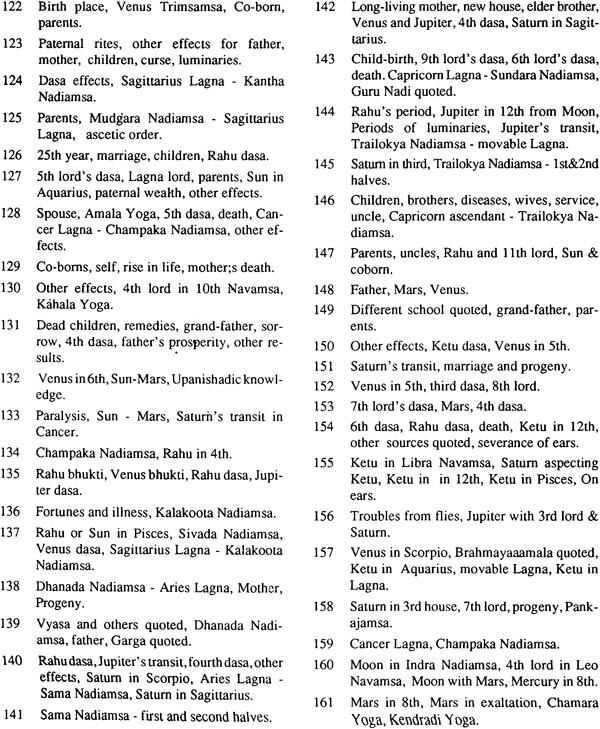 The name itself suggests that the work belongs to Kerala, in the south of India, which is a treasure-house of original astrological manuscripts like Jatakadesa Marga, Krishneeyam and Prasna Marga. Each work from Kerala is a magnum opus, unto itself. 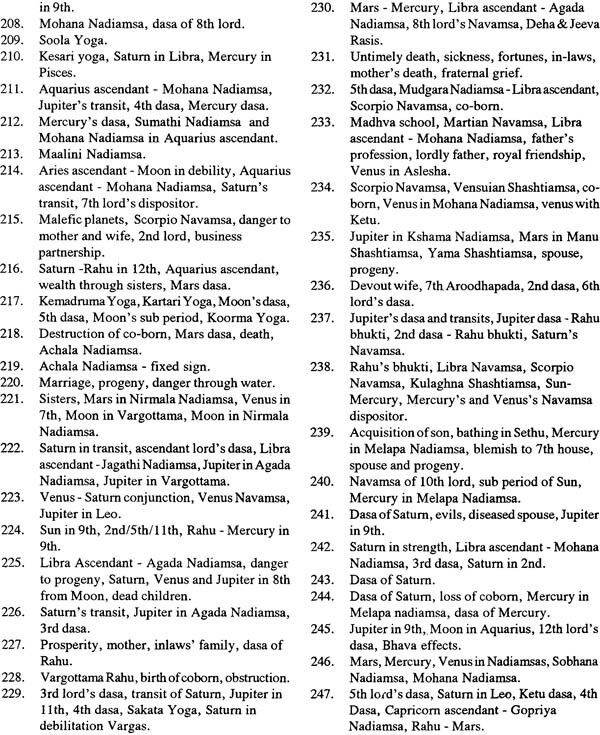 Deva Keralam has over 8200 slokas in all. 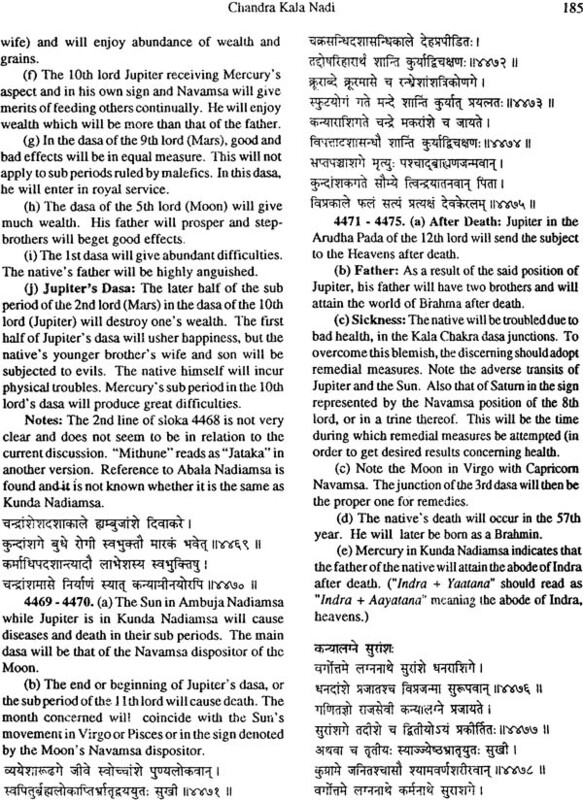 It author Achyuta had unfortunately left no clues about his lineage, place of origin, time period etc. Lack of such information does not affect the greatness of the work adversely. The name however suggests that it hails from Kerala. 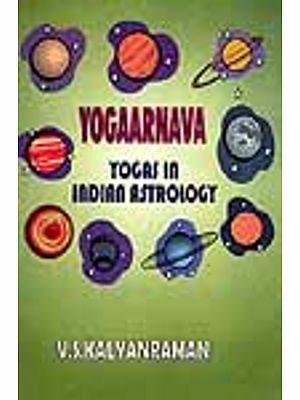 The author obviously was a man of letters in astrology and had mastered various Nadi Granthas. 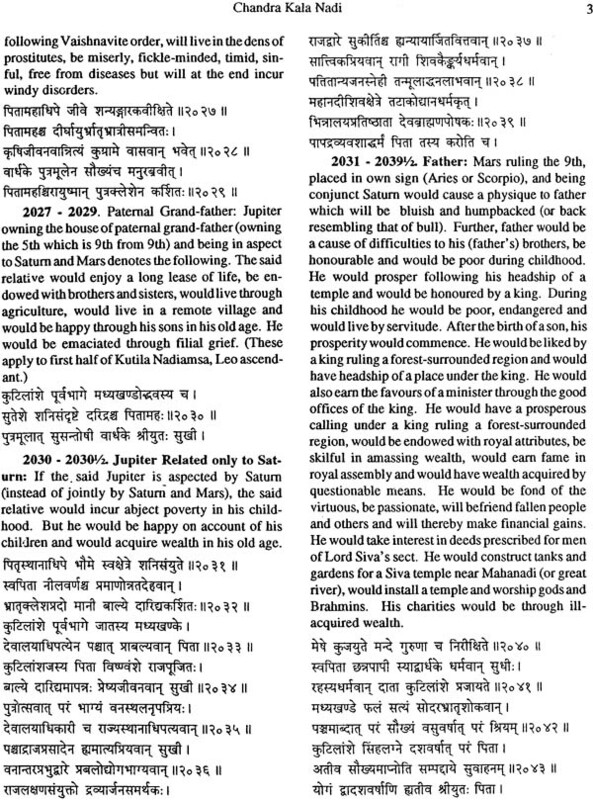 He specialized in use of Nadiamsa apart from employing Parasarian principles. 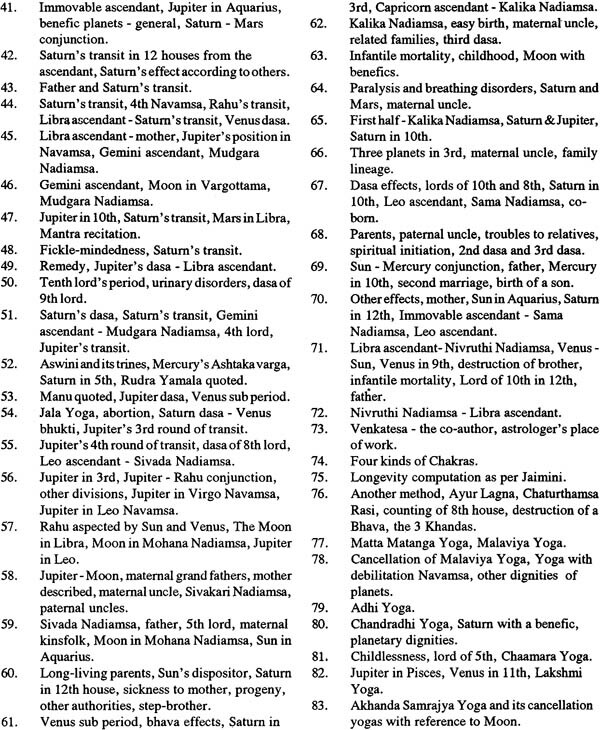 He had consult, in compiling the present work, several Nadi Granthas including Surya Nadi, Chandra Nadi, Kuja Nadi, Budha Nadi, guru Nadi, Sukra Nadi, Sani Nadi Lagna Nadi, Lagnadhipathi Nadhi, Sarva Nadi and Yoga Nadi. 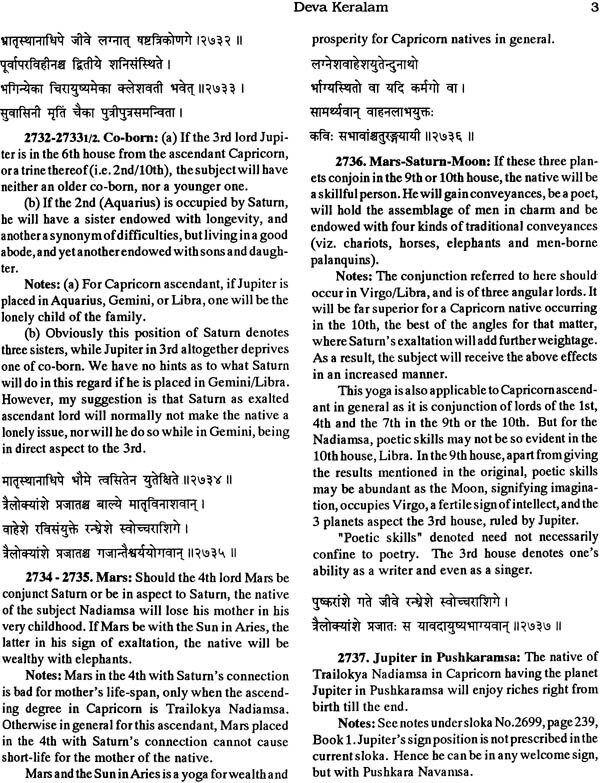 He had also quoted Garha, Vasishta, Parasara, Yavana etc. As far as I know, these Nadi are not available in any form nowadays. 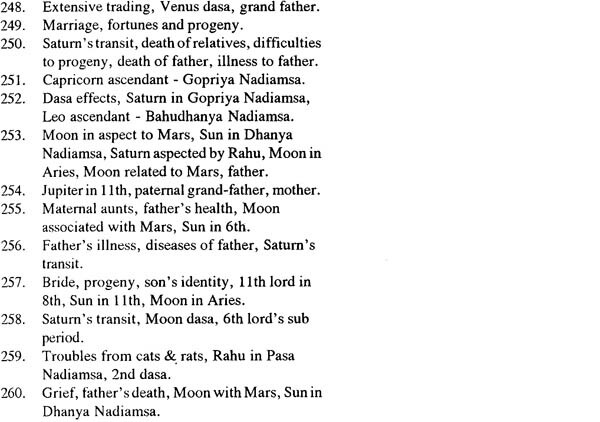 These Nadi, unlike Saptahrshi Nadi, apparently contained principkes usable in predictive astrology and not full-fledge horoscopes. 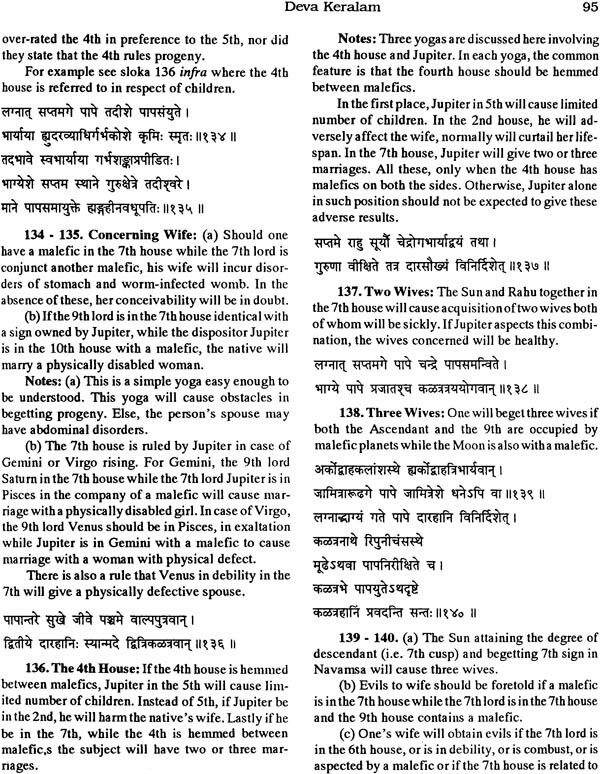 The readers may be aware, Saptharshi Nadi contains horoscopes discussing various aspects of natives, but far less instructive principls. The average reader can hardly know of the basis of conclusions without the help of an experienced tutor. 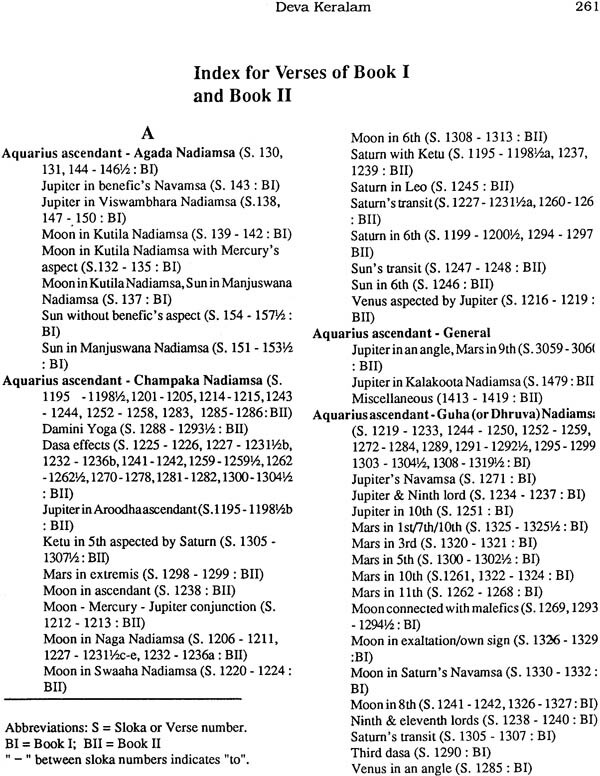 However, in case of the Nadi text consulted by our author, those apparently fulfilled, inter alia, the sole purpose of laying down rules for exhaustive interpretation of events of numerous kinds mainly from one sting pont – Nadiamsa. Other stages of instructions contain predicting without the help of Nadiamsa, i.e. 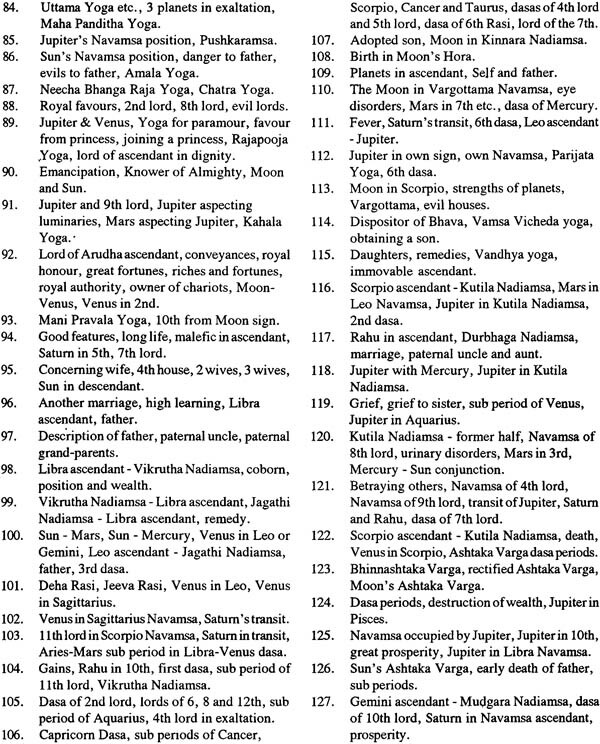 with the help of special planetary combinations, positions, Ashtaka Varaga, Dasa periods and the like as is normal for any standard work we follow. What is a Nadiamsa is necessary to be explained to the reader. 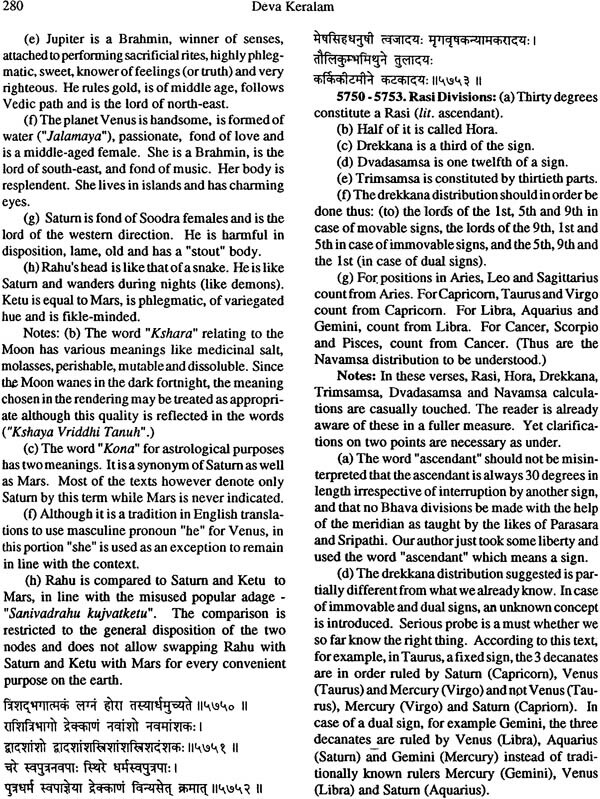 Most of us are us are aware of Shodasa Vargas, the Parasarian division of a sing or Rasi into sixteen different parts of different lengths of longitudes. 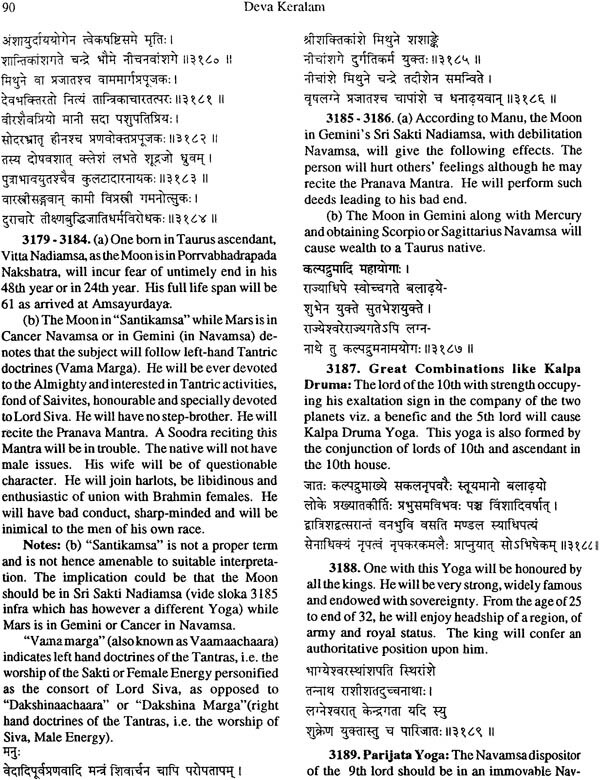 What is less commonly known or employed is Nadiamsa, the 150th part of a Rasi, or one fifth of a degree. That way,. 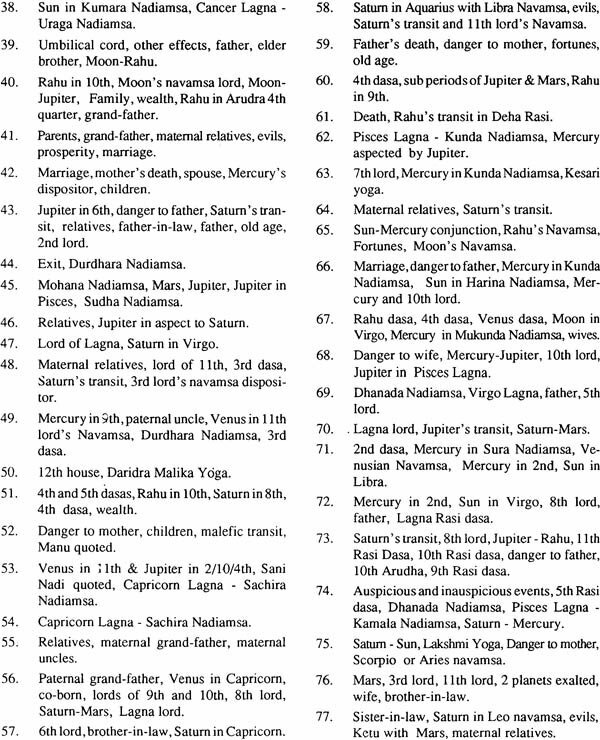 The entire space of 360 deg of the zodiac is divided into 1800 Nadiamsas. 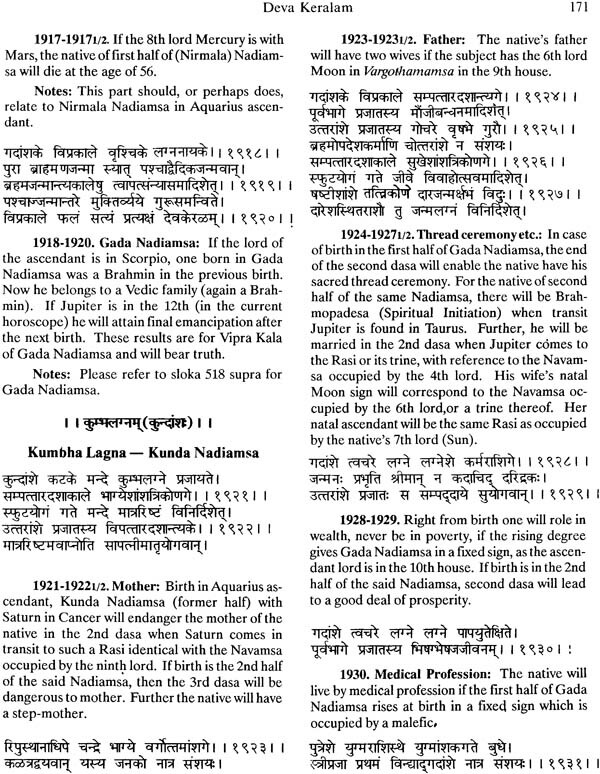 In Table 1, in the immediately ensuing pages, I have enlisted the order and names of Nadiamsas, as collected from the present work (the relevant original slokas appear much later in our work) and from late C.G. 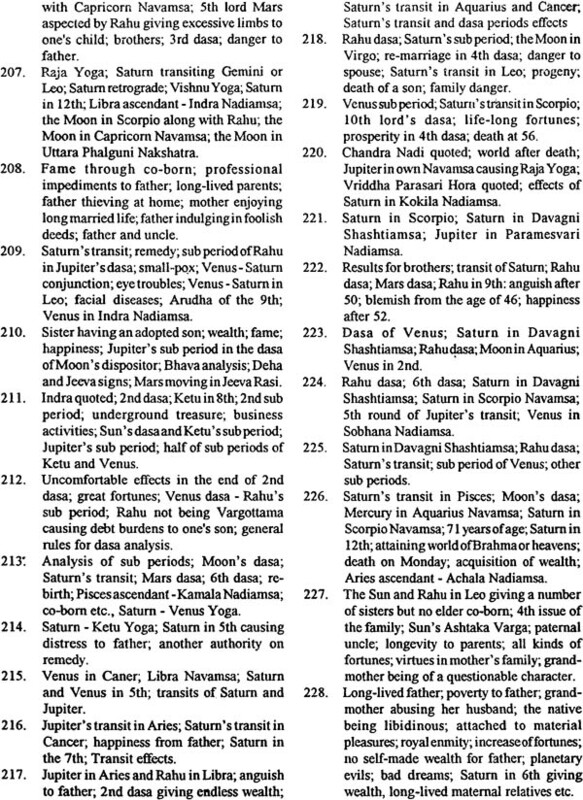 Rajan of Madras, a known authority on Nadia astrology in particular. 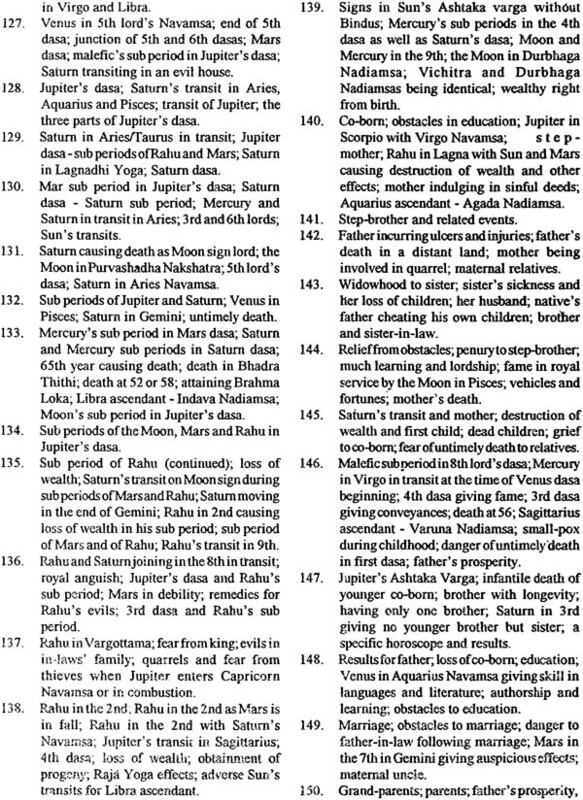 Late Rajan’s list is hence taken with a specific purpose of textual utility one some occasions. 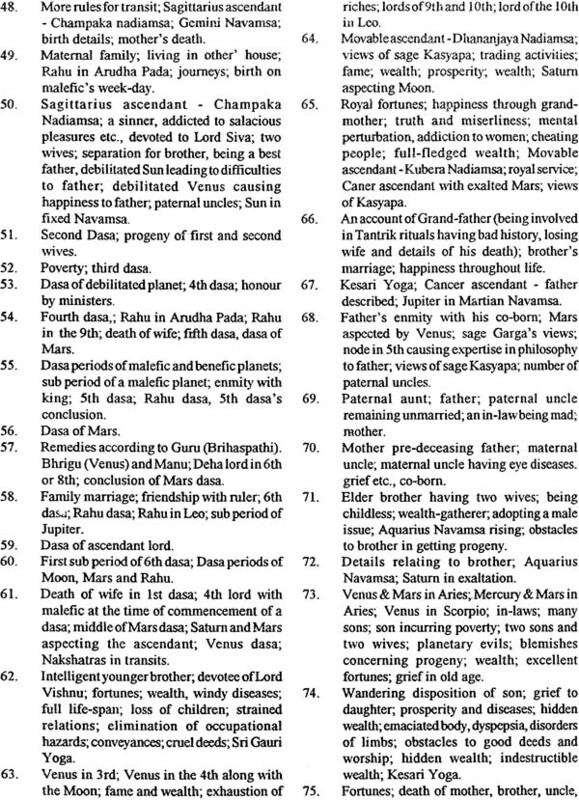 And in Table 2, the commencing and ending of these 150 Nadiamsas are given. 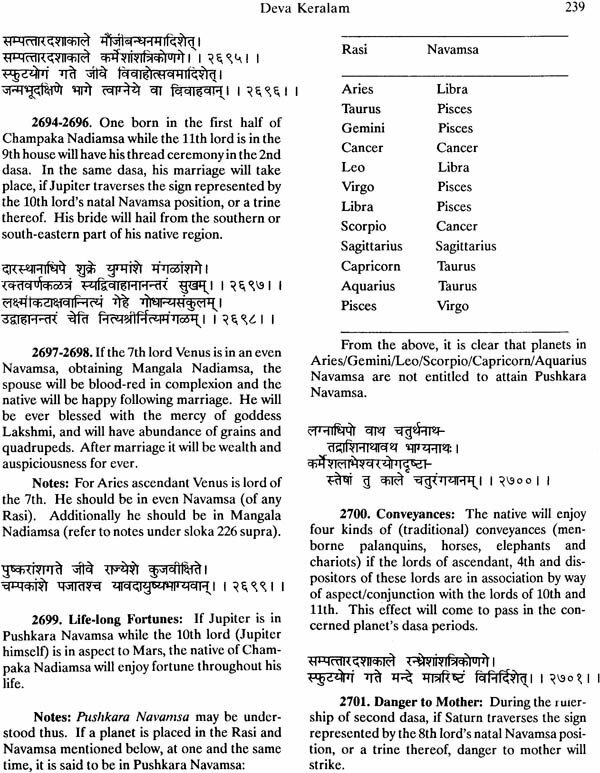 In giving notes followed the Nadiamsa divisions as show in column 5 of Table 1. The reader may use alternative spaces according to his choice and experience of he feels he can obtain better effects of the text. 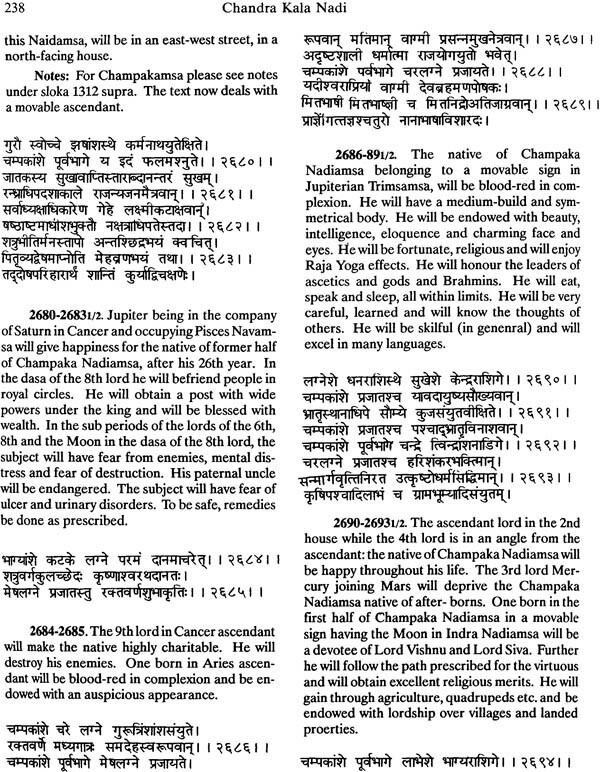 As could be observed, the order and names of these Nadiamsa are identical for all the four movable signified manner. Immovable signs again have a common pattern for themselves, but different from those followed by movable and common signs. The same is the case among the four common signs, i.e. these have an exclusive arrangement for themselves. 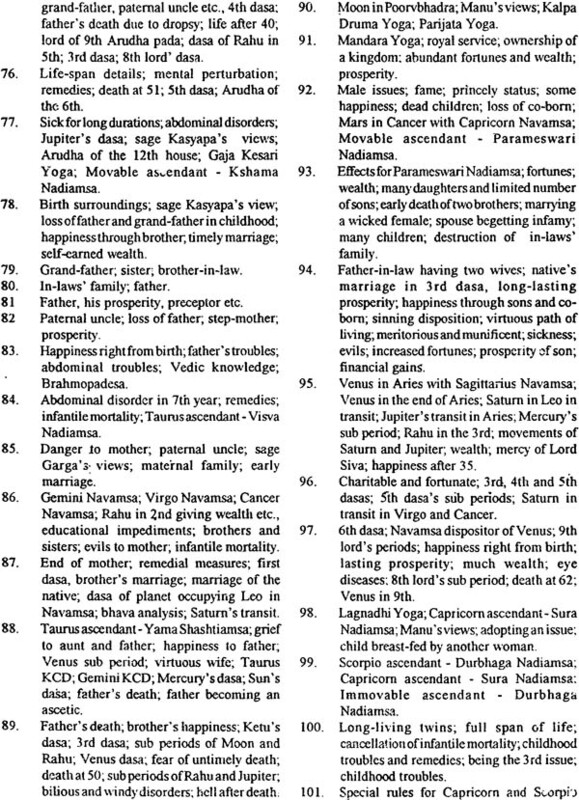 For example whatever applies in this classification and identity to Aries applies equally to Cancer Libra and Capricorn; whatever applies to Taurus applies to Leo, Scorpio and Aquarius; and lastly whatever applies to Gemini applies to Virgo, Sagittarius and Pisces. 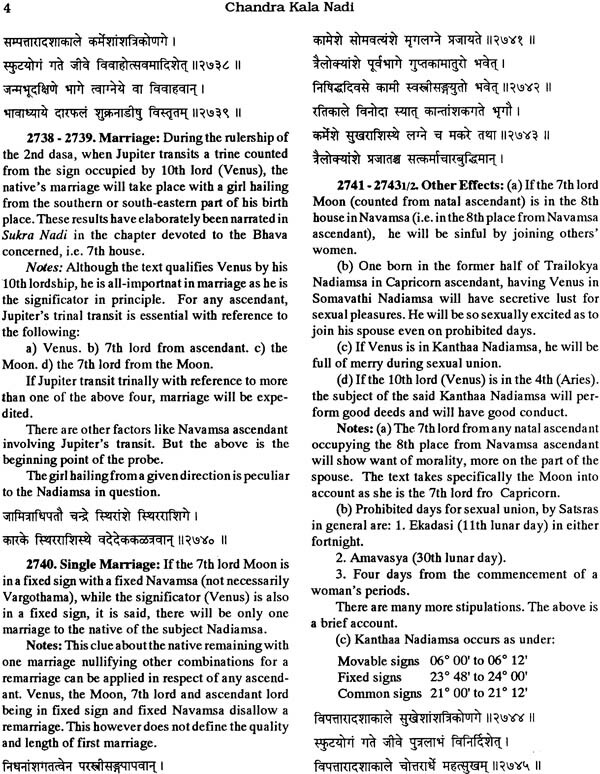 The Nadiamsa count is different for movable, immovable and common signs are could be witnessed in Table 1. In movable signs, the count is regular order from 1 to 150 (as shown in col 1). For common sign, the count is reverse, i.e. from to 1 (i.e. 150, 149, 148, 147, 146, etc… as shown in col.2). 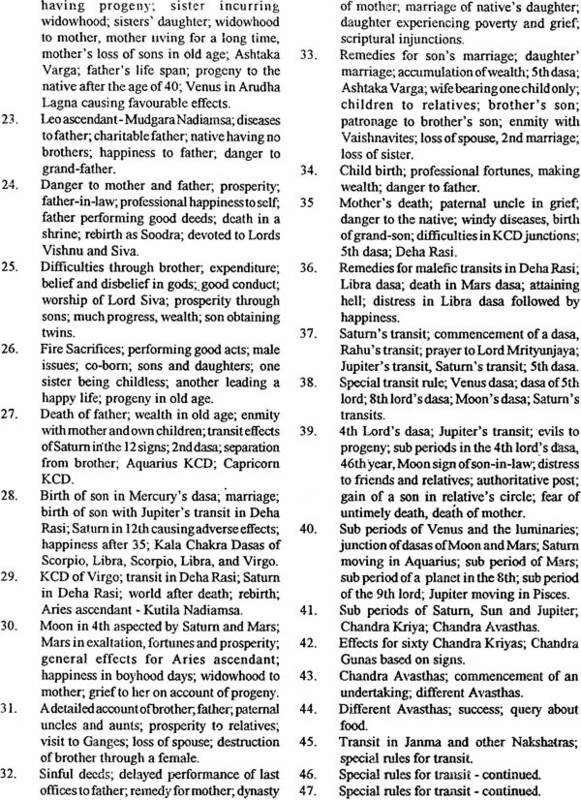 For common signs the count is firstly from 76 to 150 and then from 1 to 75 (as shown in col.3). Keeping the list for movable sign as basis. 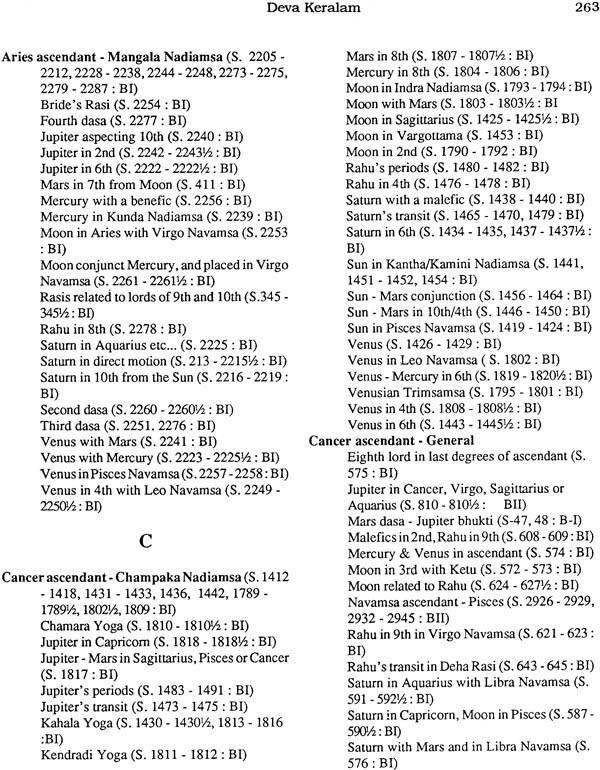 Col. 4 gives the names of these segments as per C.G. Rajan while col.5 given what is at one stage followed by our present work. Table 1 will of course make the whole thing very clear. 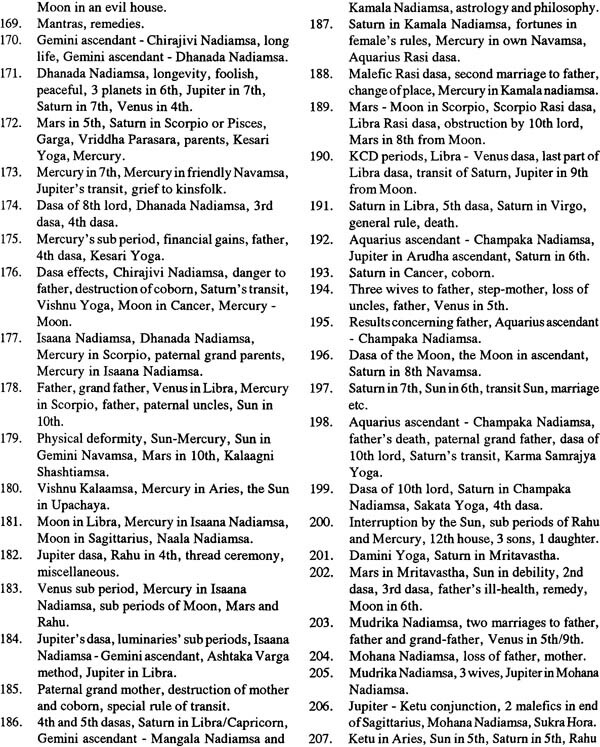 Now if you observe the list, Vasudha Nadiamsa is the 1st of a movable sign, the 150th of an immovable (or fixed) sign and the 76th of a common (or dual) sign. 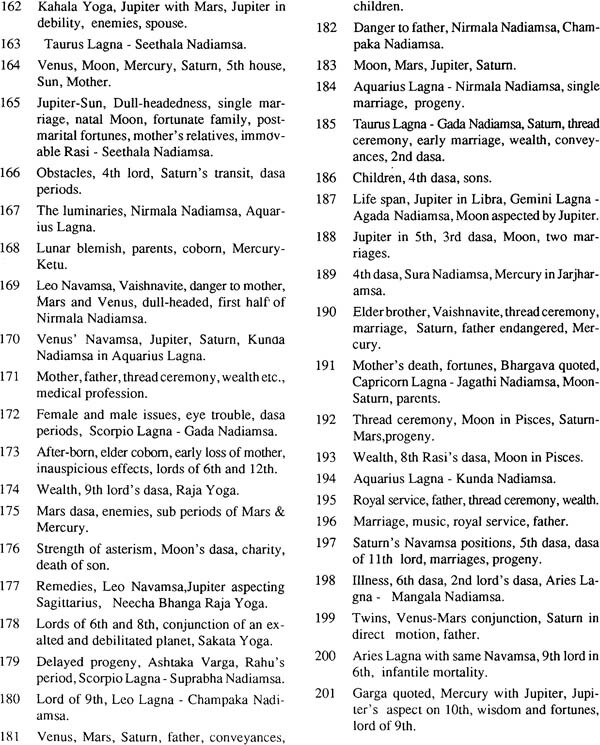 Vaishnavi Nadiamsa is the 2nd of a movable sign, 149th of an immovable sign and the 77th of a common sign. Braahmi is the 3rd of should be selected from Table 2. 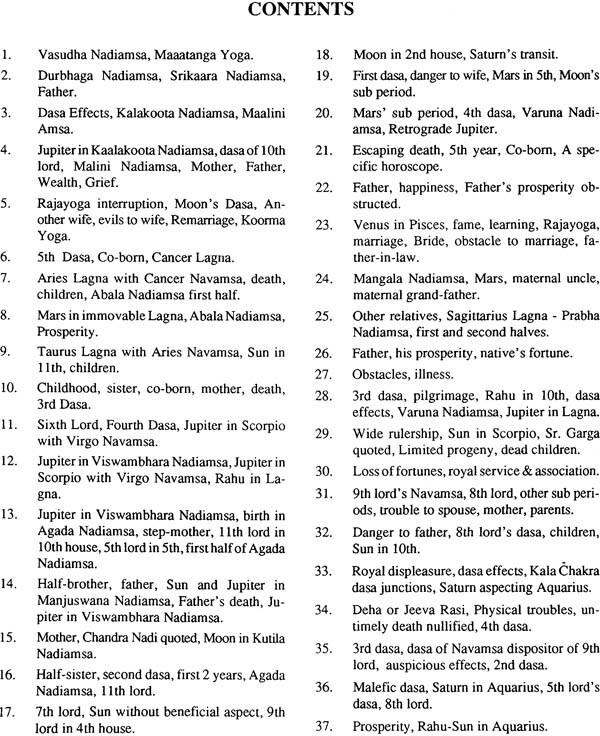 Details about all the names and positions of Nadiamsa can be well understood from Table 1. Table 2 is an easy one ad can be used to know to serial number of Nasiamsa when the actual longitude is selected following which the exact name of Nadiamsa should be referred to in Table 1. For example there is a planet or the ascendant cusp in one of the movable signs (Aries, Cancer Libra, Capricorn) t 10 deg 52’ of arc. 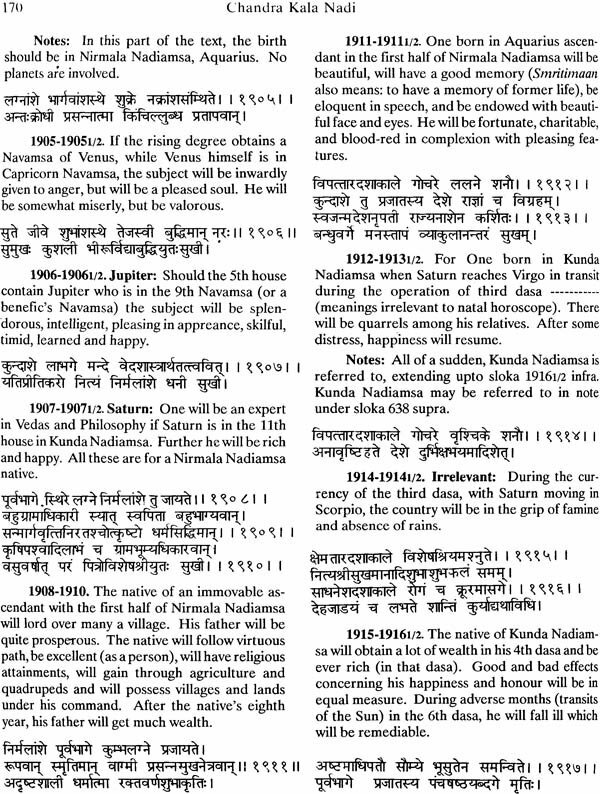 That is 55th Nadiamsa which is seethala Nadiamsa (as per col 1. Table 1). 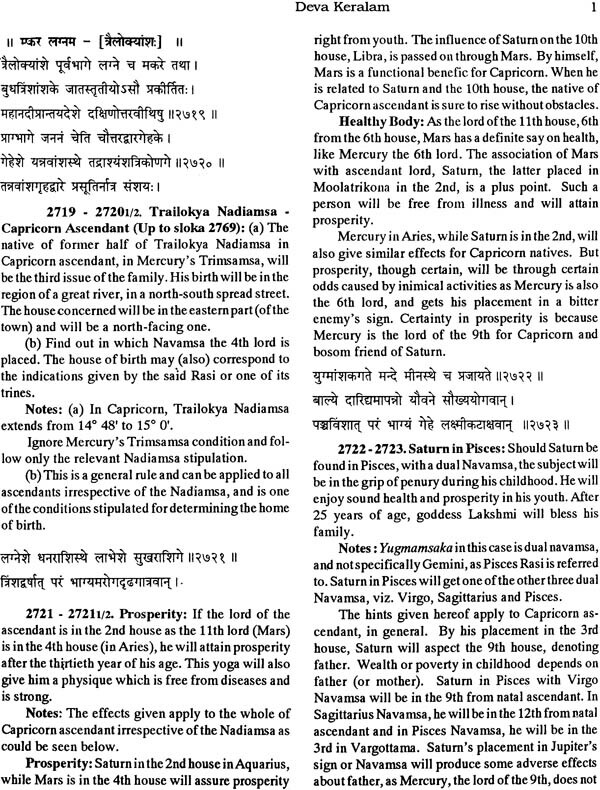 The same longitude in an immovable sign (Taurus, Leo Scorpio, Aquarius) causes Apavargaa Nadiamsa (as per col. 2 of Table 1). Again in a common sign (Gemini, Virgo, Sagittarius, Pisces) the relevant Nadiamsa is Raudri (as per col. 3 of Table 1). 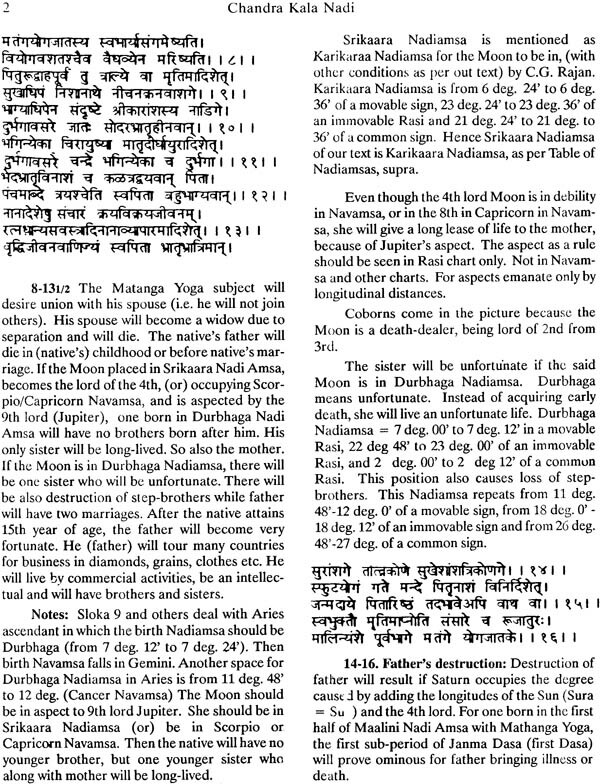 We should do well to remember that the first Nadiamsa in a movable sign is Parameswari Nadiamsa, and in a common sign it is Mahamaaya Nadiamsa. For ascendant, its cusp should be used to find out its Nadiamsa position, and for planets the usual longitudes we obtain from the ephemeris. 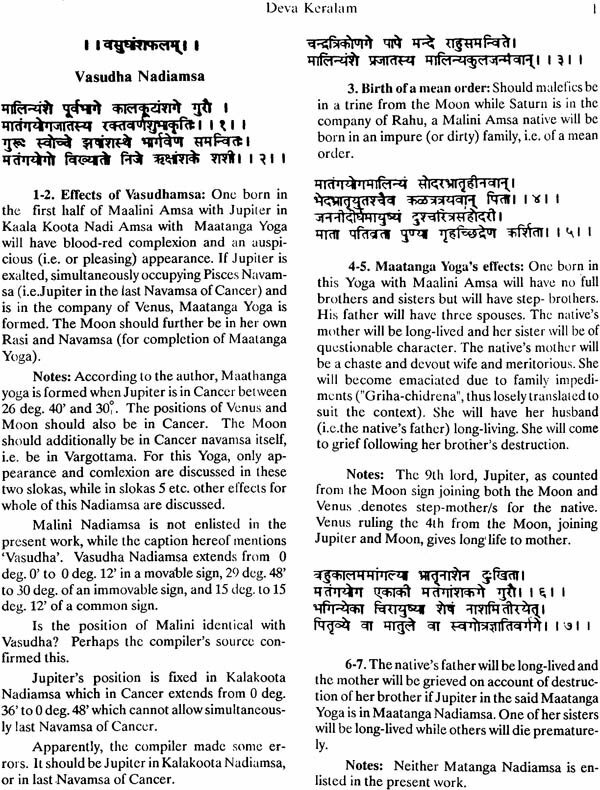 In many cases, the text divides the Nadiamsa in four part called Vipra, Kshatriya, Vaisya and Soodra Kalas. 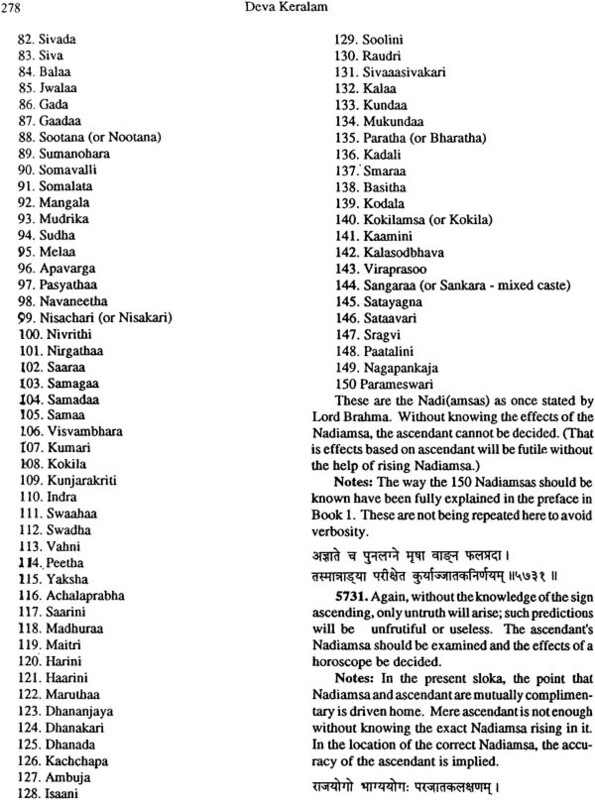 Vipra denote a Brahmin, Kshatriya a ruler, Vaisya a trader and Soodra the fourth caste as per Vedic divisions. Kala means time. 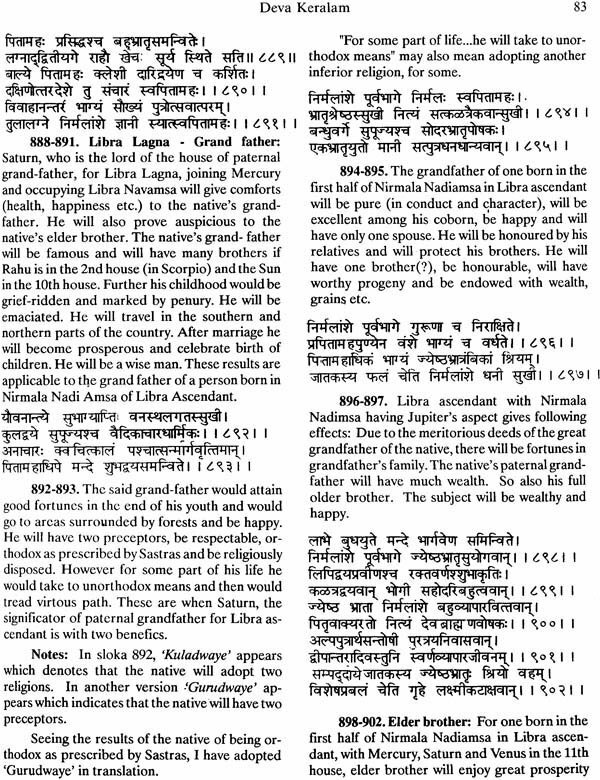 Simply these are quarters 1 to 4 (each of 3’ longitude) of a given Nadiamsa and re superior or inferior in that order for certain purposes. In other words they do not always indicate the birth in a certain caste as prevailing days. 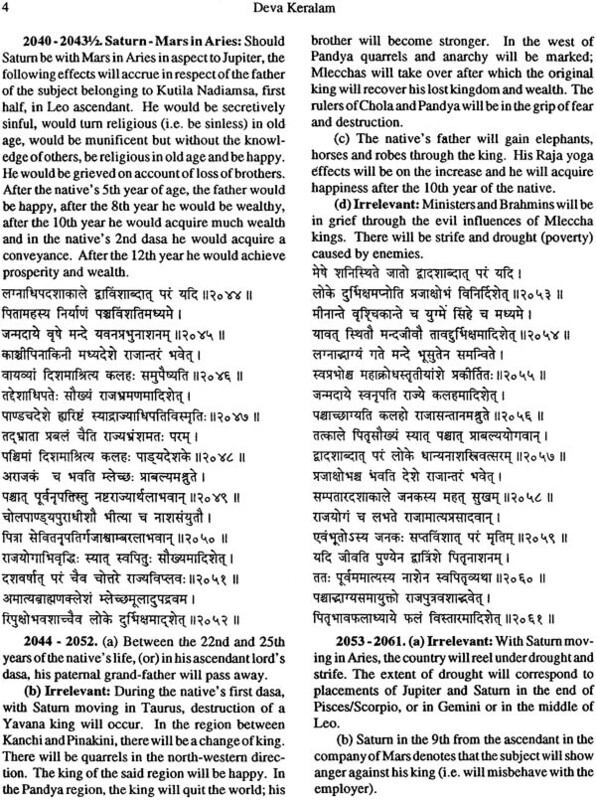 These are actually meant for attainment of perfection in prediction. 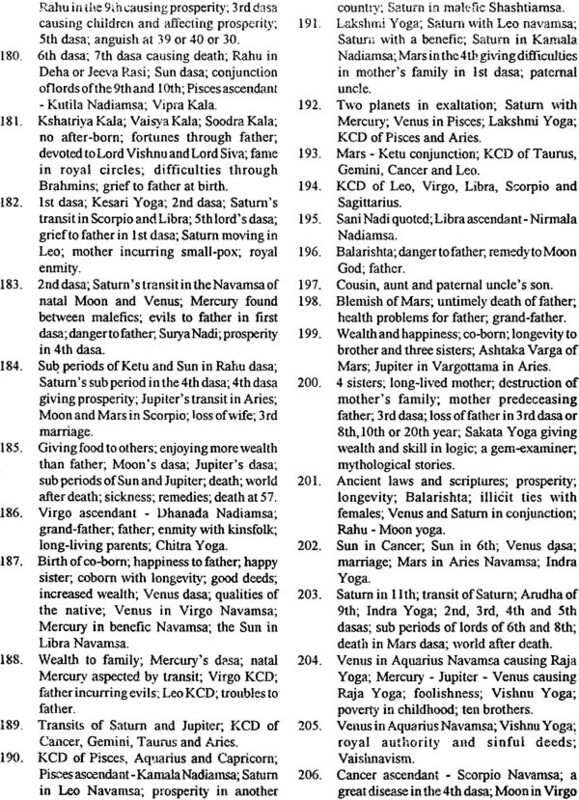 Needless to mention, this kind of division makes the whole zodiac into 7200 equal minor segments, each of 3’ arc (total 216000 accounting for 360deg) – 1800 each of Vipra, Kshatriya, Vaisya and Soodra Kalas, the use of which hardly allow accuracy to escape from the hands of a master astrologer. The reader going through the pages will find the extent of changes in events quarter (viz, Vipra etc.) of a Nadiamsa can introduce. In the same Nadiamsa, for example Vipra Kala gives certain result while another of the 3 parts gives completely different results. 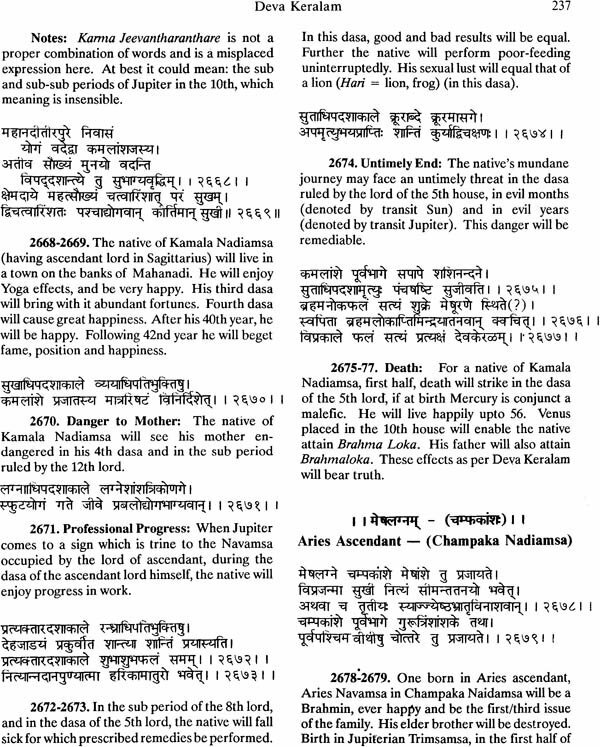 Another division made of this Nadiamsa is first half and second half making the whole zodiac in 3600 parts. That is of 6’ longitude. Here again the effects are absolutely in mutual variance. 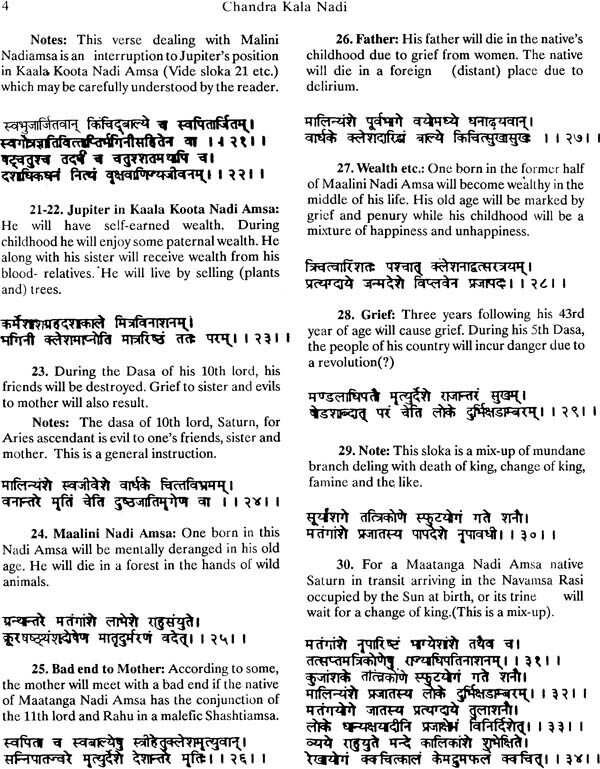 On quit limited occasions, we find that a Nadiamsa is made into six parts attiring to Garga’s authority. 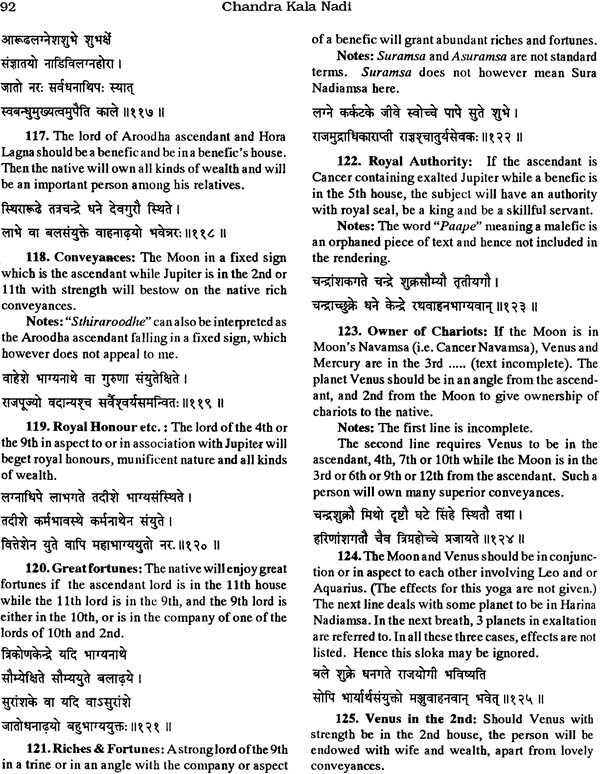 Meseems, this divisin is however questionable and must have been wrongly attributed to the said sage. 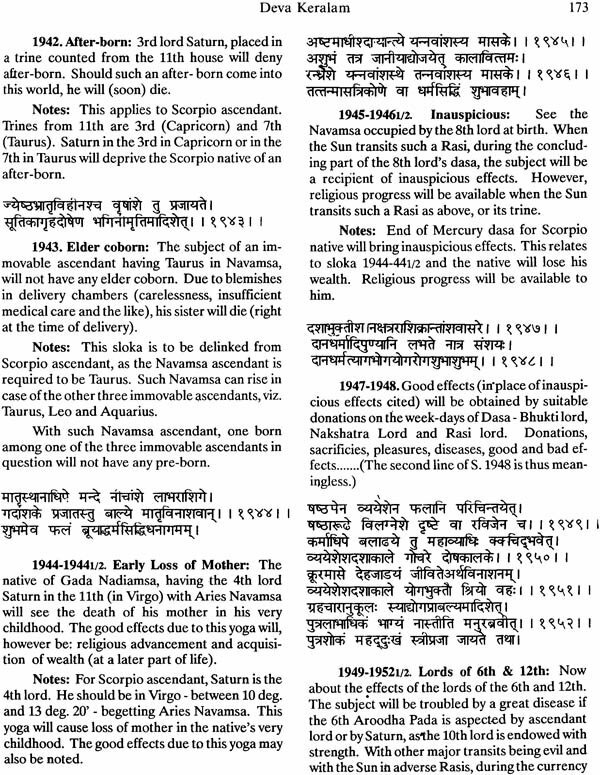 True, exact degree of ascendant in terms of degrees and minutes of are is very essential to use some of the instructions contained hereof. Then without that, there can be no real astrology. Astrology of approximation can only be disastrous. 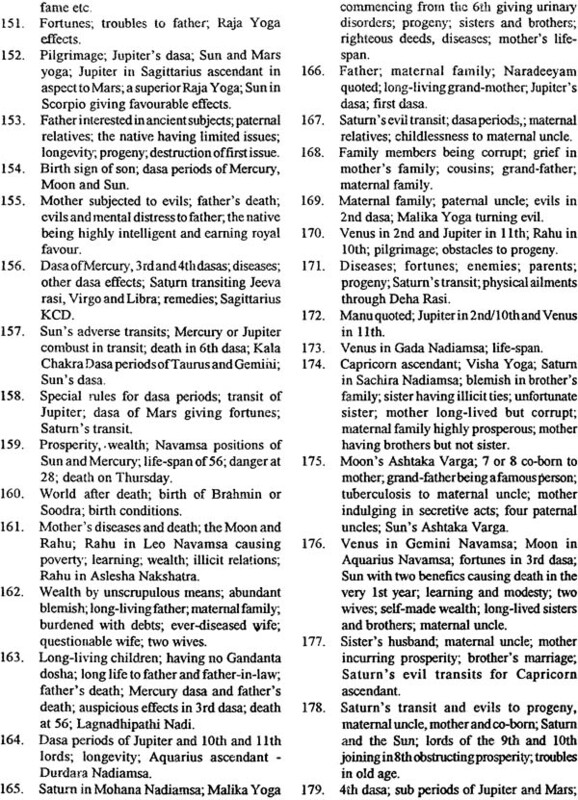 To use the principles contaimsas, the astrologer must also obtain excellence in standard methods of rectification, prenatal epoch theory and through Horary methods. 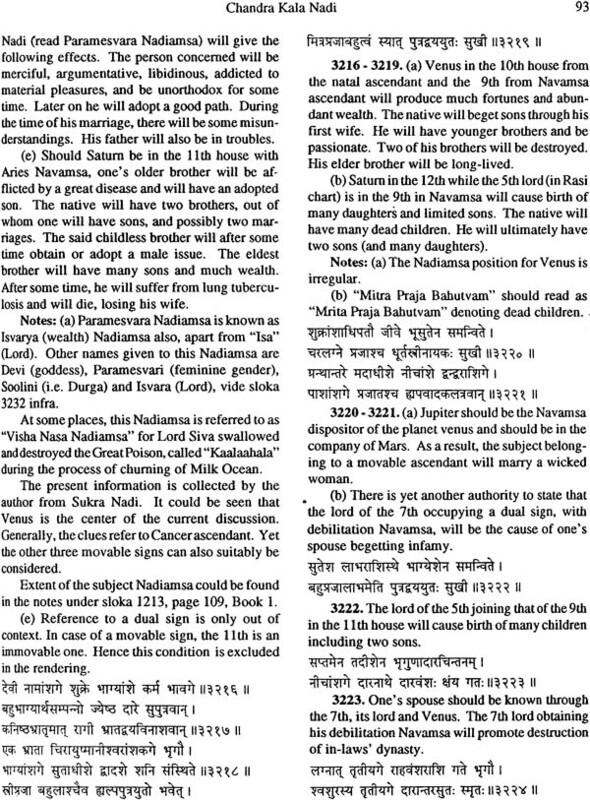 Once that is done, with known events the correct Nadiamsa can be located. 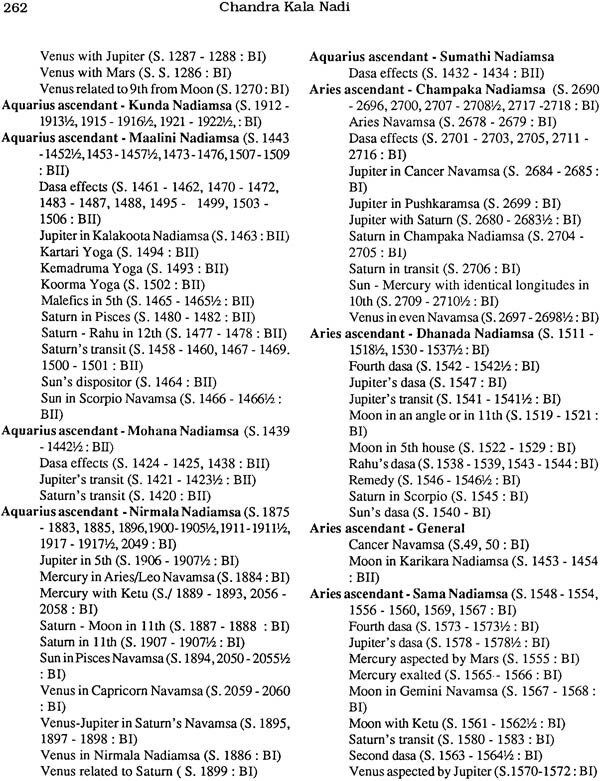 For an established astrology, Ayanamsa o precession is not an unsettled issue. 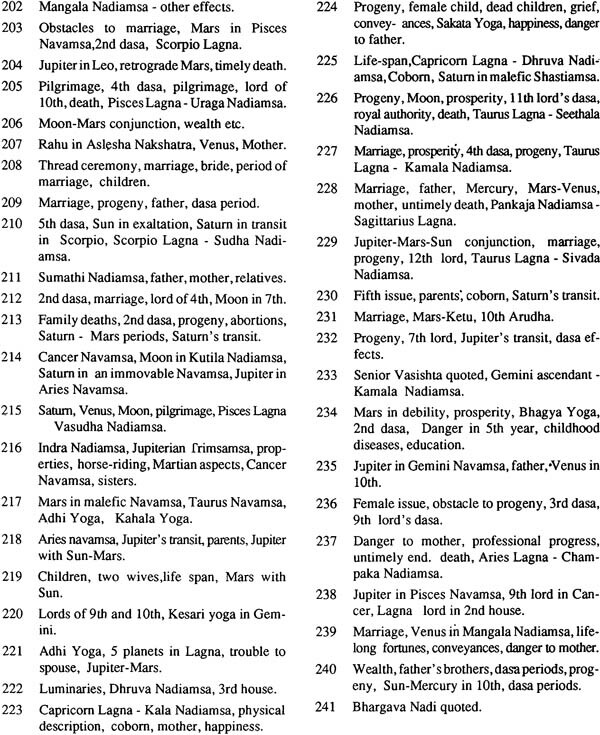 Let me however state for the benefit of the new reader that Lahiri’s Chaotrapaksha Ayanamsa is the accurate one when the horoscope is cast using the exact coordinates at every point. Not just for Nadiamsa, accuracy of Ayanamsa is a must even in other cases, like Navamsa, Sapthamsa and Shashtiamsa. 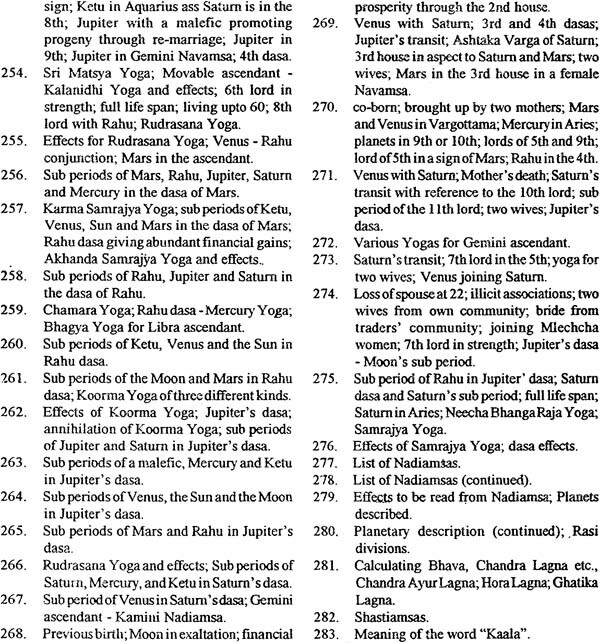 To wit, if a planet, say Saturn is in Aries 19deg’ as per Lahiri ayanamsa, another ayanamsa even with a small difference of minus 2’ of are can place Saturn somewhat ahead and give it Libra Navamsa instead of Virgo navamsa due to Lahiri. 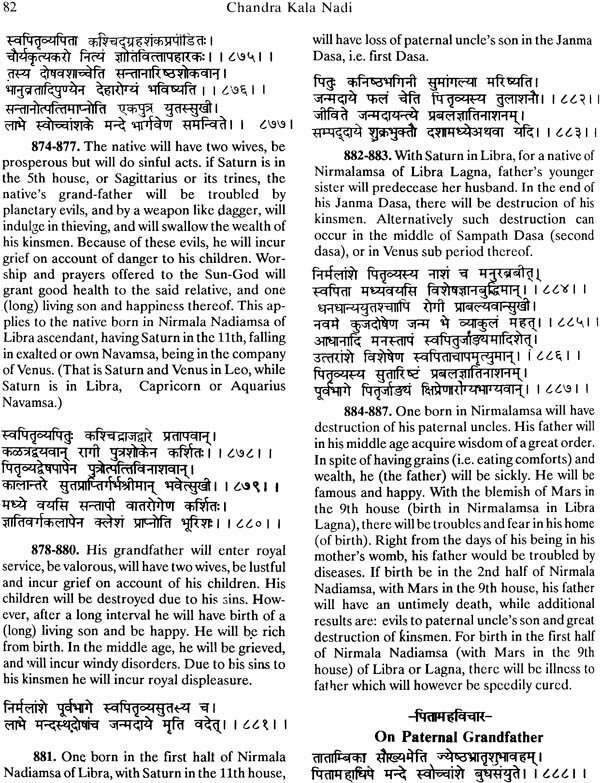 Saturn even in Aries Rasi with Libra Navamsa protect one from heart ailments, gives him longevity and helps him progress in his calling. The same Saturn with aries sign position but in Virgo Navasma makes him wholly unreliable, and, akes him a victim of some sort of diseases of hand legs. This difference could be easily located by an experienced astrologer. Same is the case with other division including Nadiamsa. I have great pleasure in presenting herewith Book II of Deva Keralam. The encouragement given by the readers following appearance of Book I hwereof is thankfully acknowledged. Sloka No. 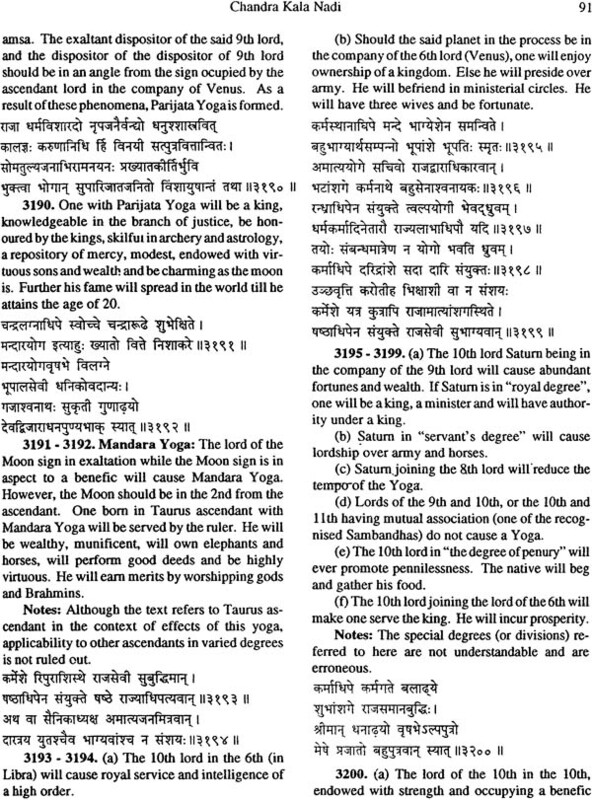 1 to 3407 by Achyuta in the first phase. Slola No. 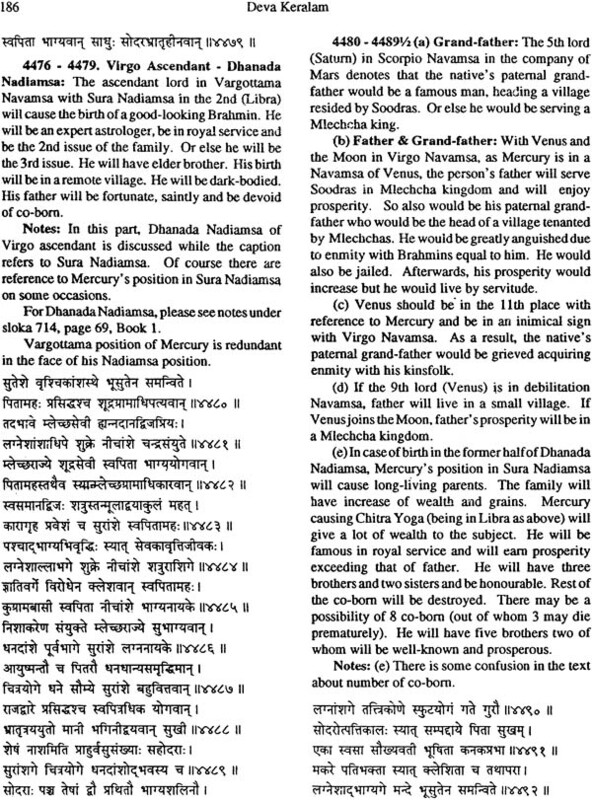 1 to 4775 by Venkatesa in the later phase. 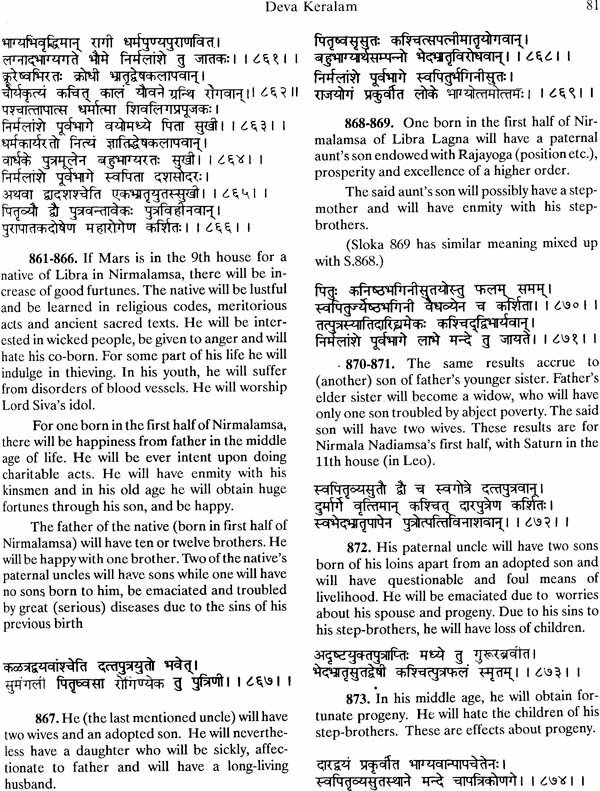 Slokas 1 to sloka 2718 of Achyuta in Book I.
II. 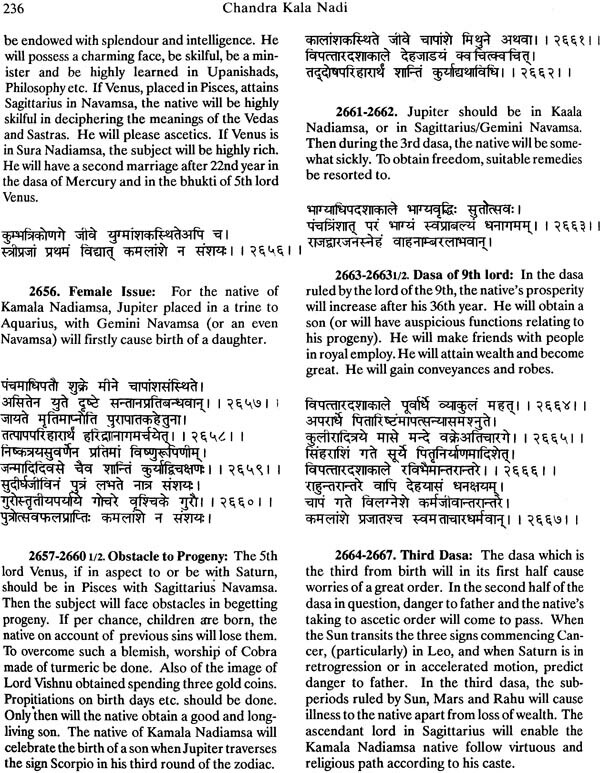 Rest of the work from slokas from No. 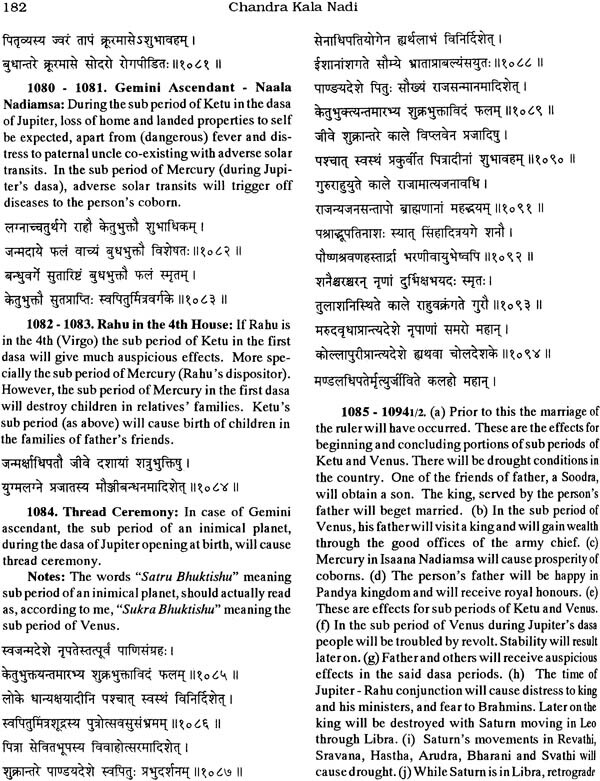 1998 to 4775 of Venkatesa is being brought out as Book III. 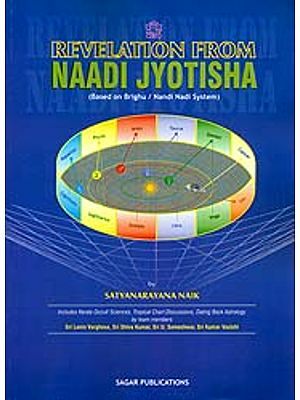 In the present volume also, there are many general principles applicable to the various ascendants, apart from Nadiamsa discussions confined to given signs. 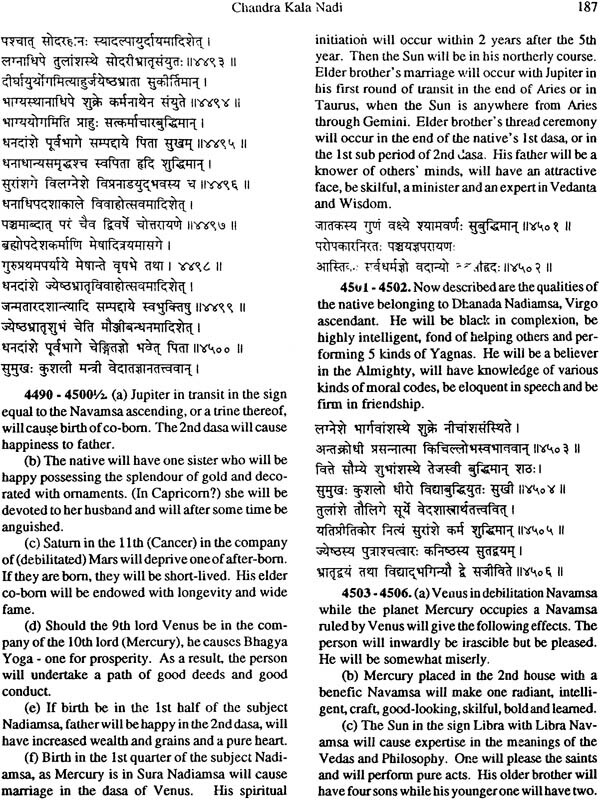 The reader will be able to understand the same as he progresses with the study of the text, remembering at the same time the general outlines given in the prefece for Book I.
I have every hope that the reader will forgive me for my shortcomings if any and accord a favourable reception to my present efforts. 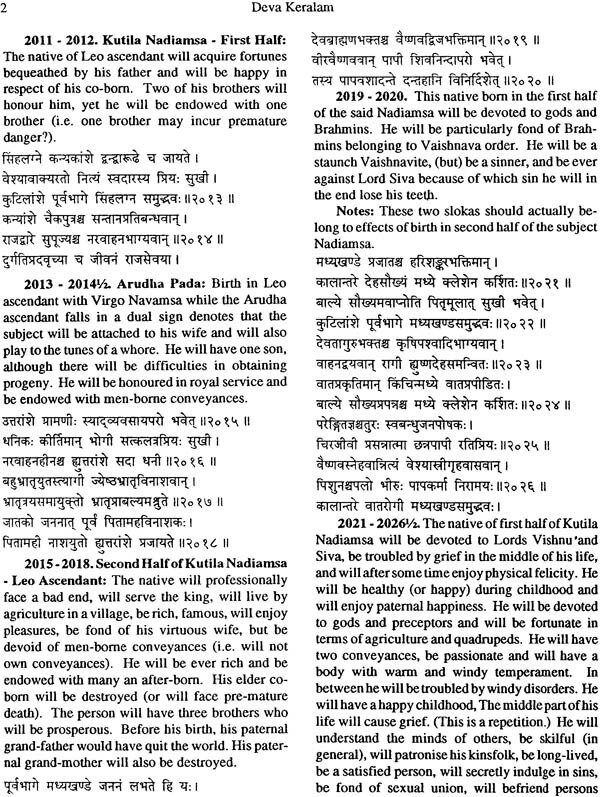 Presented herewith is Book III Deva Keralam (Chandra Kala Nadi) from sloka No. 1998 to 5774 (i.e. 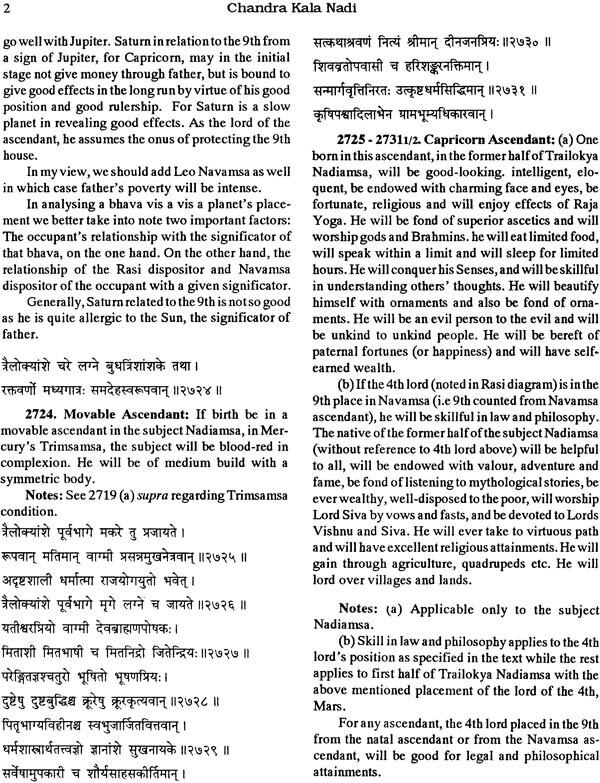 3796slokas) – the portion compiled by Venkatesa. Sloka No. 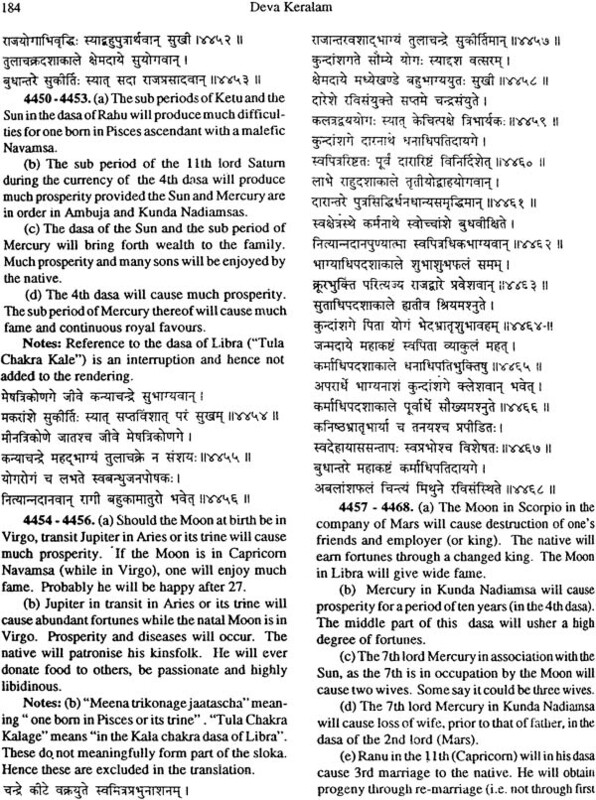 1 to 2718 by Achyuta in Book I.
Sloka No.2719 t 3407 of Achyuta, and sloka No. 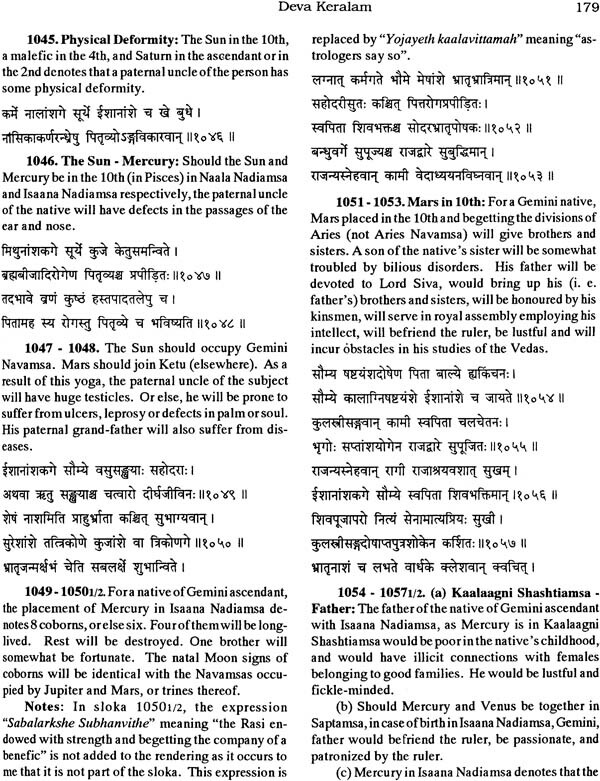 1 to 1997 of Venkatesa in Book II. Sloka No. 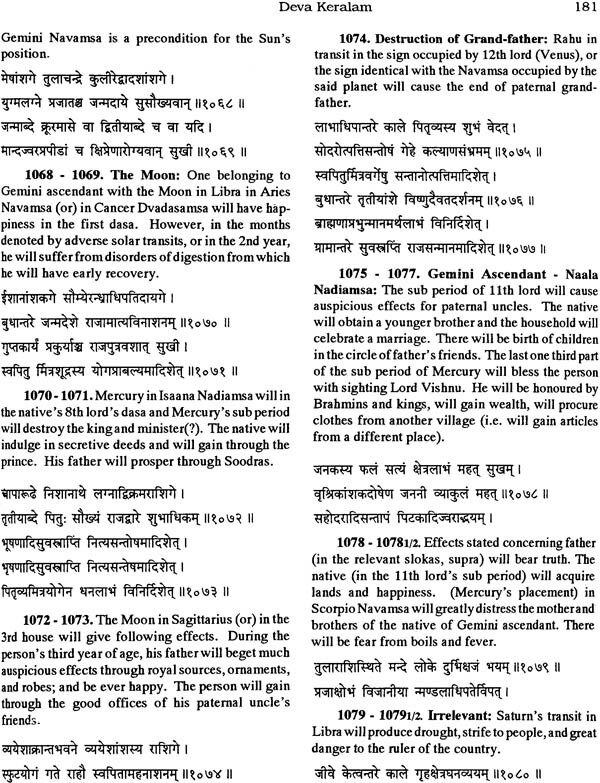 1998 to 5774 by Venkatesa in Book III. 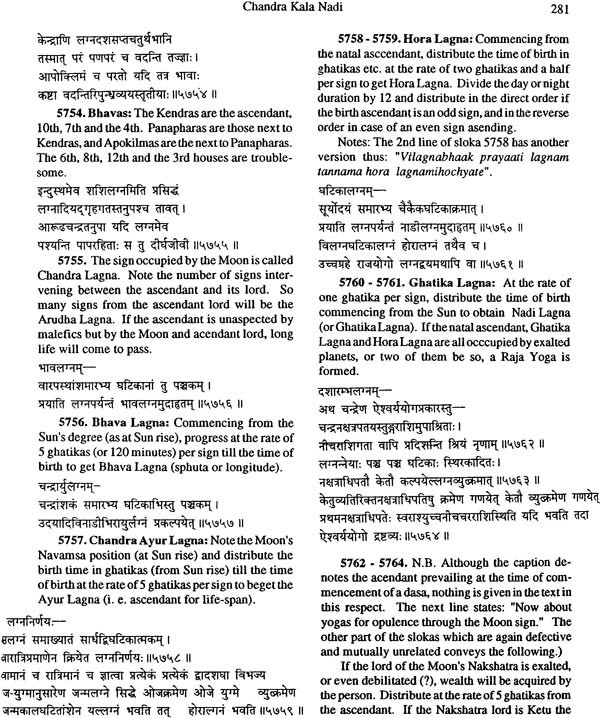 These 3 volumes put together have a total of 9181 slokas in all (3407 by Achyuta and 5774 by Vekatesa) for which complete English translation has been provided by me. As the discerning reader understands, the work covers two areas of delineation. 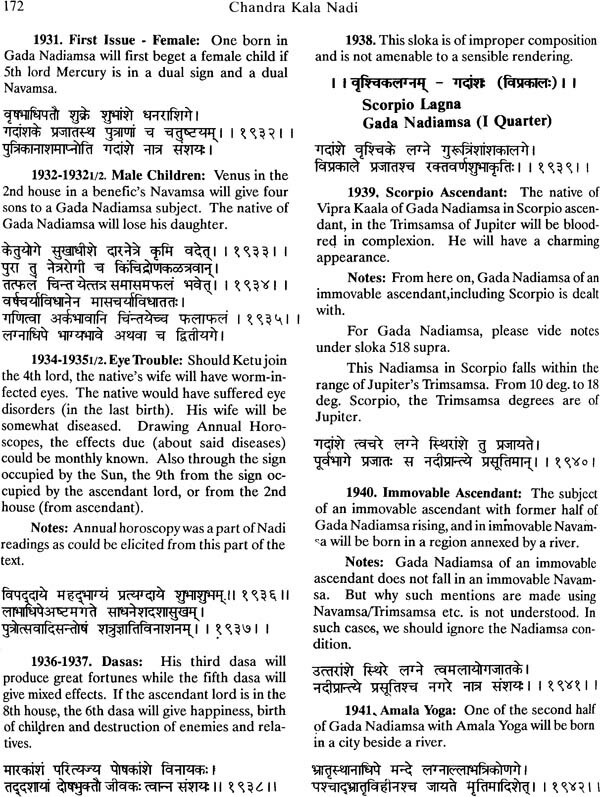 A particular space of rising degree called Nadiamsa is used to depict a series of event to occur in the native’s life, one of the subtniques of handling a horoscope. 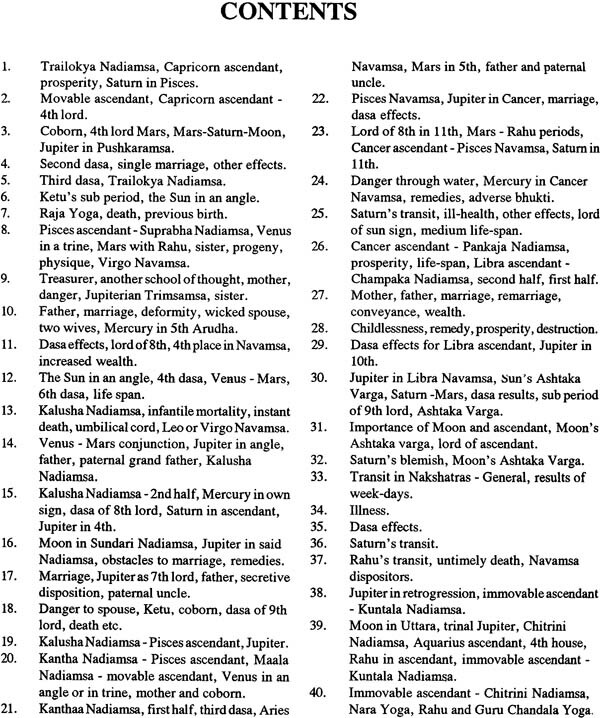 On the hand, countless general principles are enumerated on the lines done by popular series of text-books like Parasara Hora, Phala Deepika, Saravali, Jataka Parijata and Sarvartha Chainamani dealing with natal horoscopy including dasa effects, transits and the like. 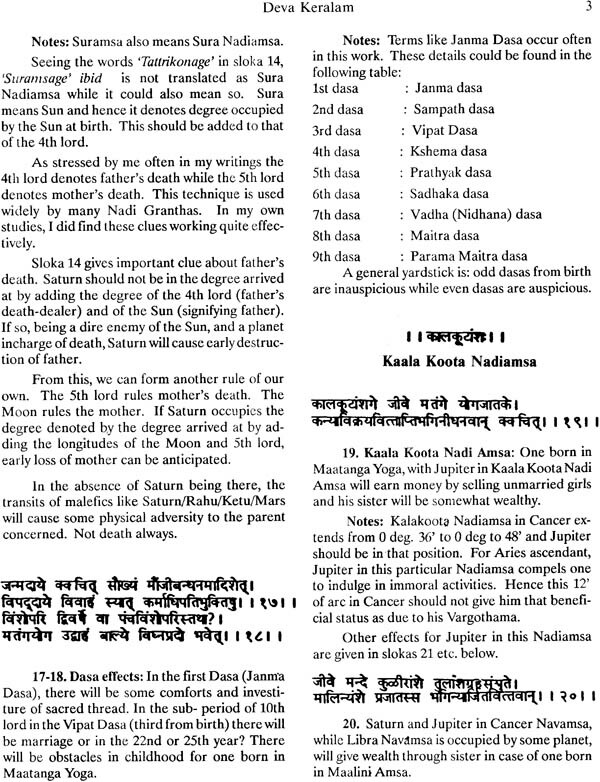 In some general principles that do not consider Nadiamsa technique are incorporated in the Nadiamsa reading. To avoid confusion to the reader, these have been separated by me in the translation, as far possible. 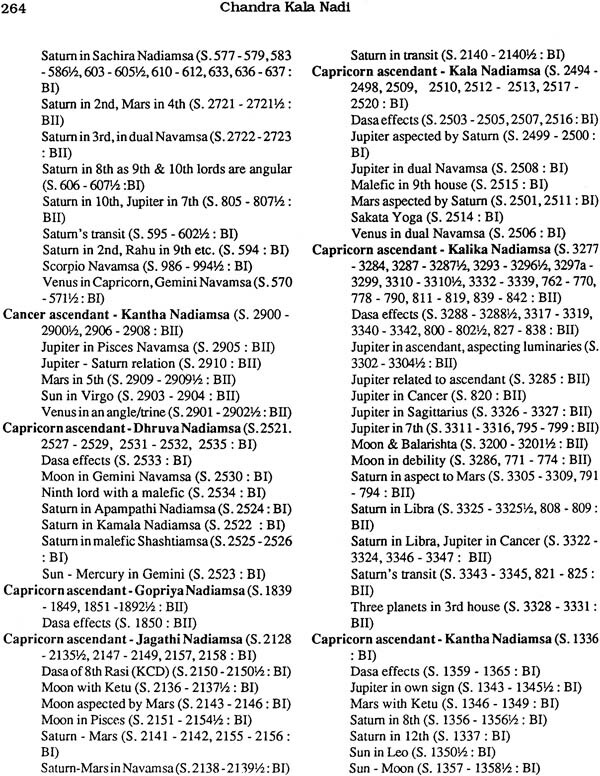 Further, these have more clearly sorted out in the index given at the end of present volume. 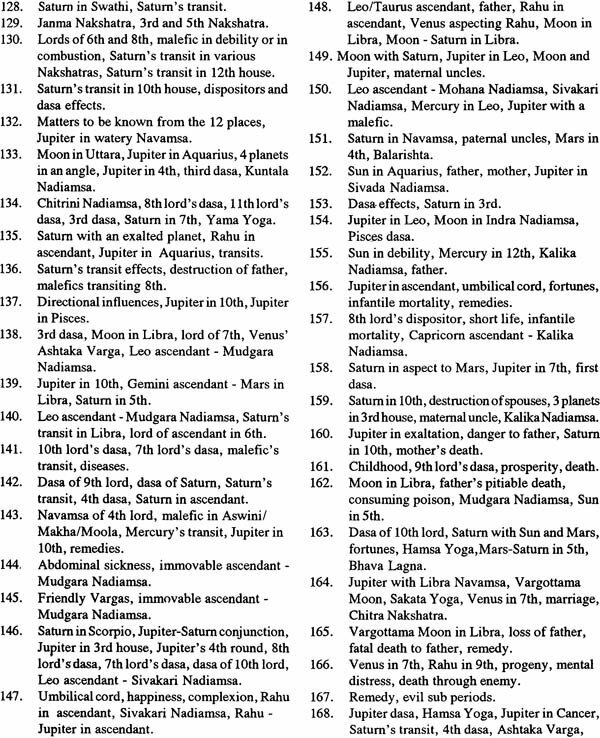 The index now given embraces all the 3 parts. 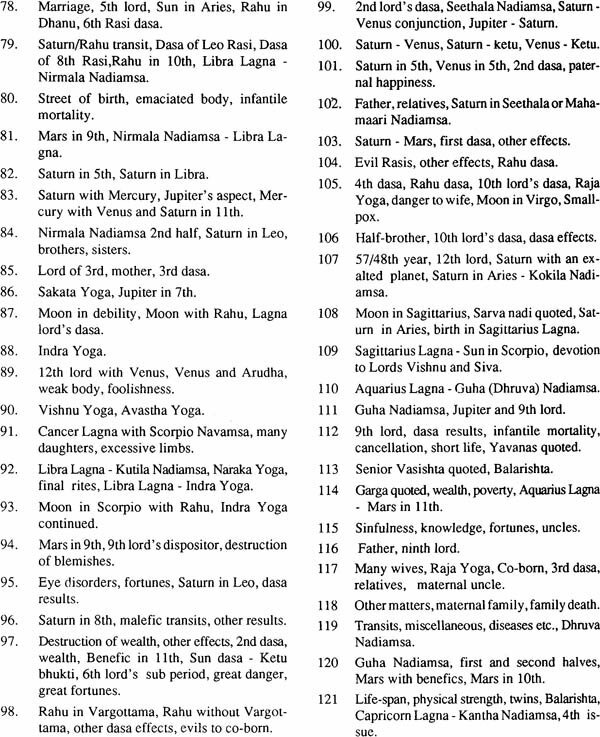 As the reader knows, each sign has 150 Nadiamsa and the 12 signs have total of 1800 Nadiamsa. 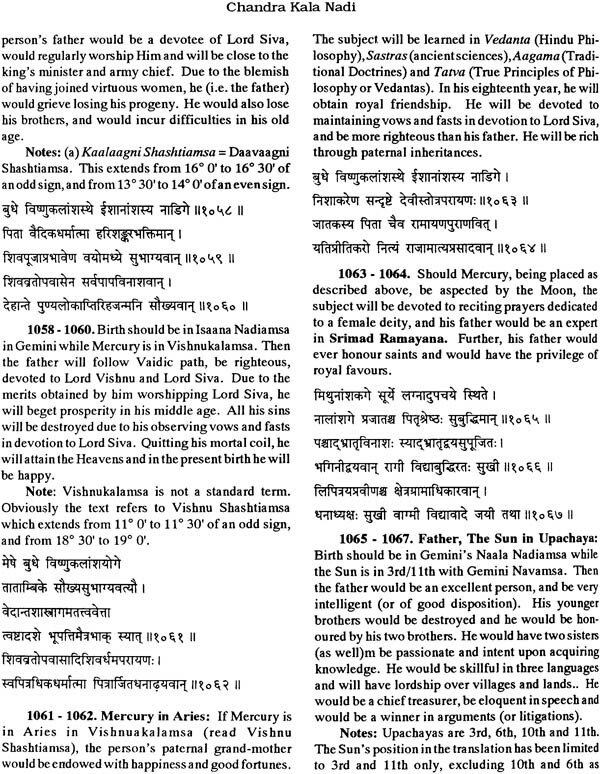 It is not humanly possible to bring out a work dealing with all the 1800 Nadiamsa. 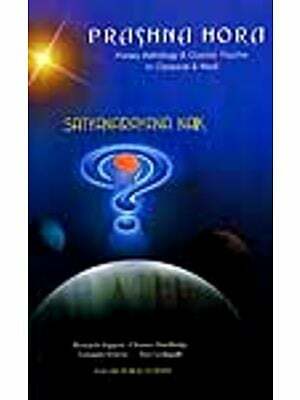 To the extent possible, the authors Achyuta and Venkatesa. Gathered a large amount of information on this most subtle division. 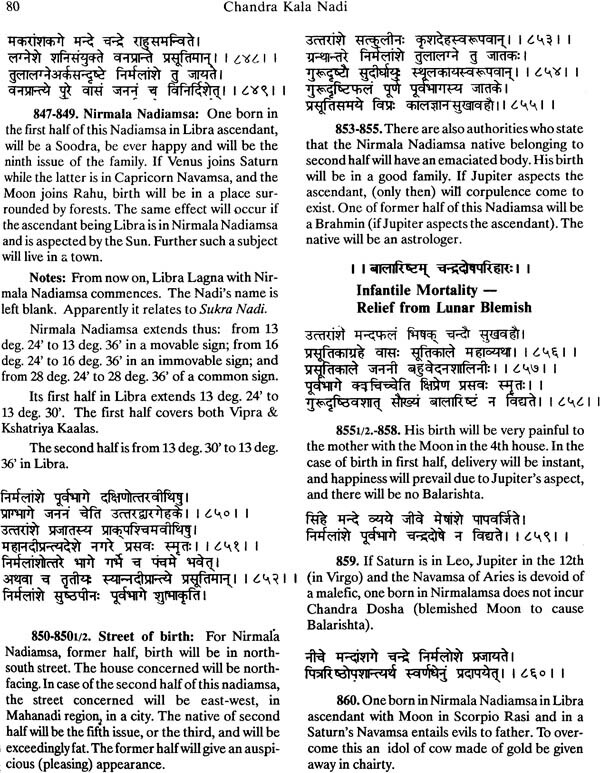 An intelligent reader can multiply the use of a Nadimsa four-fold keeping in mind the three classifications of the 12 zodiacal signs into movable, fixed and common signs. 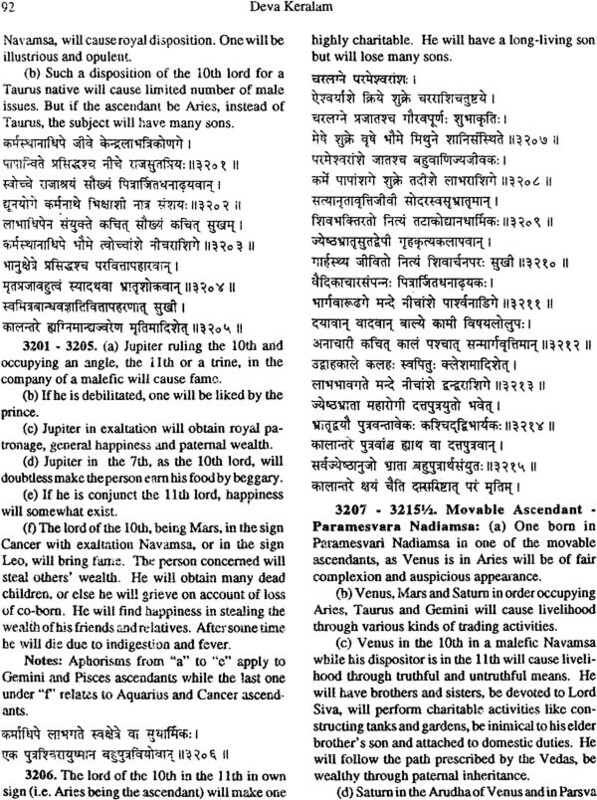 For example, a rule given for a certain Nadiamsa for Aries can be suitably extended to the other three movable signs, viz. Cancer, Libra and Capricorn. 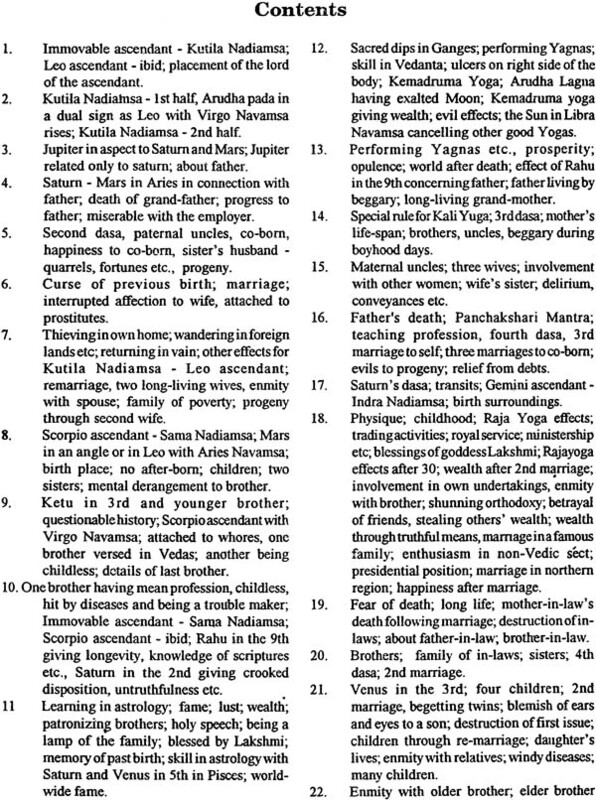 Similarly the four fixed Taurus, Leo, Scorpio and Aquarius can be brought under the second category. The three dual signs Gemini, Virgo, Sagittarius and Pisces from part of the 3rd group. While doing so, the involvement of planet should b judiciously understood. This is because the same planet plays a different role for each sign ascending. 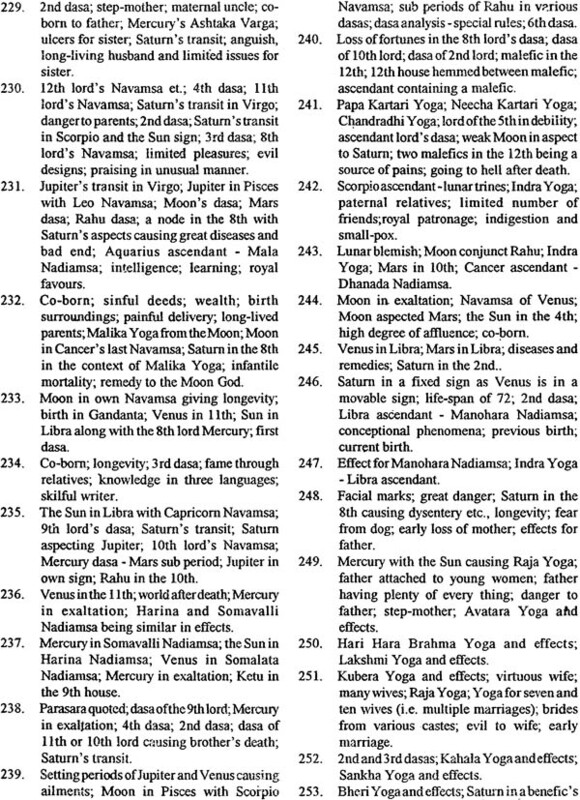 The ext excels in merits in tactfully combining the usage of Vimsottari dasa and Kala cakra dasa. 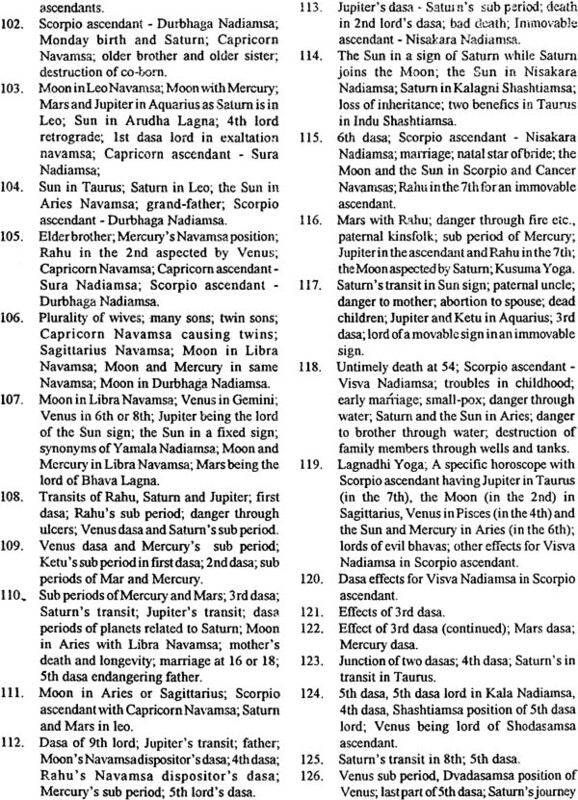 So also in applying transits with reference to the signs caused by certain Navamsa positions. Many such rare techniques are available in this wonderful work. 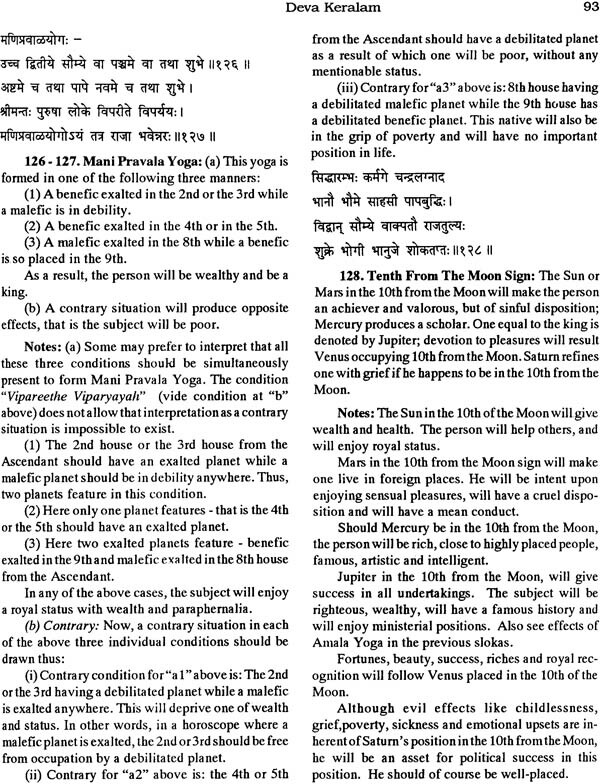 One who uses such techniques frequently will be able to issue successful predictions. I sincerely believe that the reader will find our present efforts useful and forgive me for my shortcomings if any. Mr. Narinder Sagar of Sagar Publications deserves thanks for undertaking the task of bring out this voluminous work considering the huge amount of money that the production of a book of this size requires.